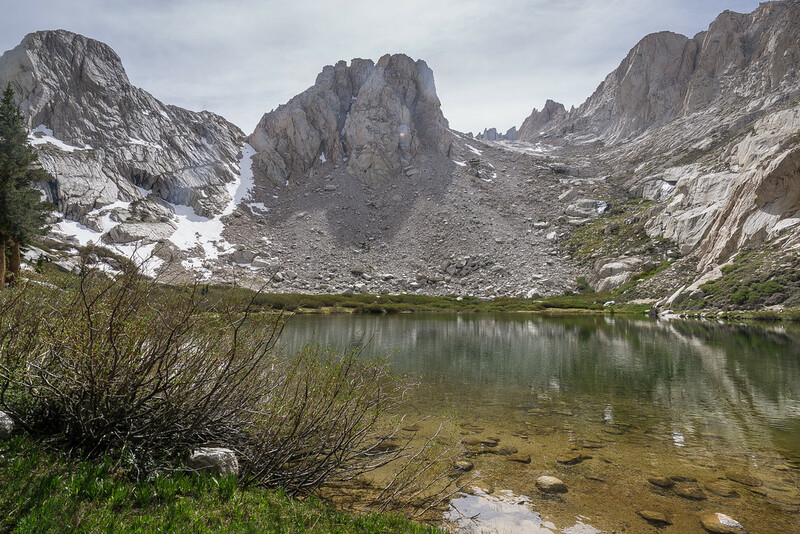 The High Sierra Trail to Mt Whitney is a challenging 75-mile trek whose scenery ranges from the giant forest of Sequoia National park, gorgeous mountain lakes, the Kern River Valley and of course the rocky jagged terrain of Mt Whitney. 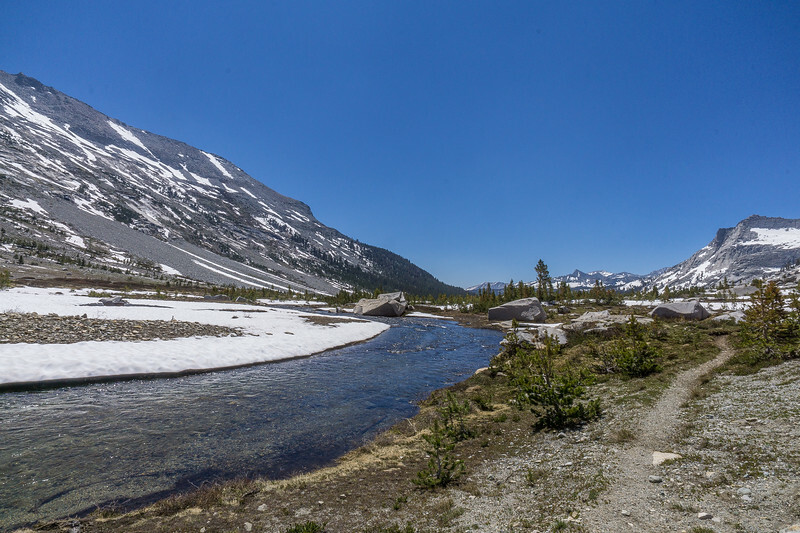 I did not end up sticking to the above schedule, due to some wintery conditions on day two, we did not make it all the way to get to Arroyo Junction and ended up sleeping in Kaweah Gap, which was sketchy but beautiful. Day 3 we were able to make push hard and make up the lost time to get back on schedule. 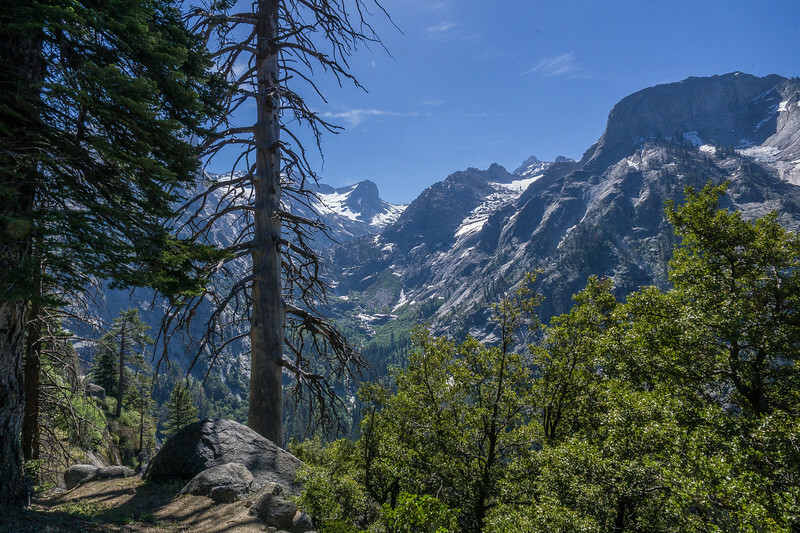 My initial planning began at backpacker.com , but the link I had to their specific HIgh Sierra Trail article is no longer active. My first part of business for this hike is obtaining wilderness permits. I wrongly thought this would be simple, but it is more than just a phone call with my credit card at hand. From the research I have done, it looks like I can not secure permits via phone, email or web. You have to fill out the forms, and either snail mail them or fax them. 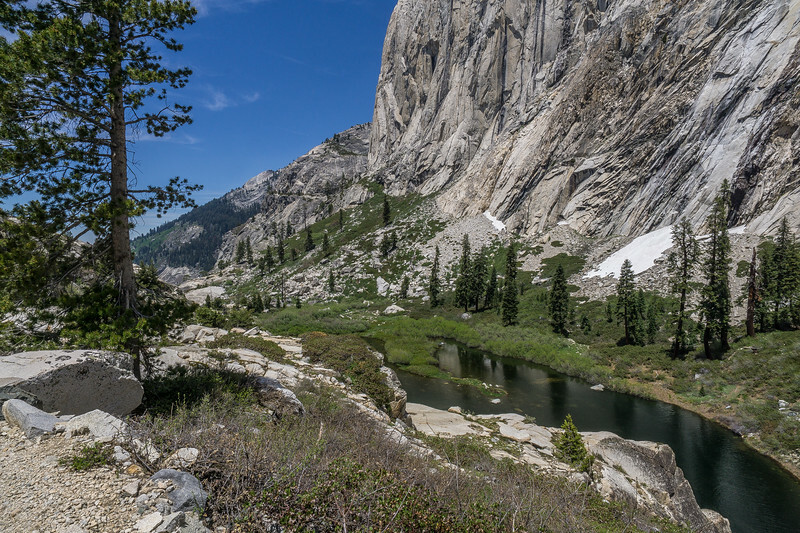 Information for reserving a wilderness permit for the High Sierra Trail to Mount Whitney from Sequoia Nation park can be found here . Update: Looks like they no longer accept Faxing applications which is awesome! The link in the previous paragraph is still valid and it details how you can email the permits in. I wanted to secure my permits as quickly as possible, but I do not own a fax? Would email have been that hard? Instead of waiting for my permit to go through the snail mail, I found a website called eFax. I filled out my wilderness permit request form, printed it out, signed it and scanned it back onto my computer. 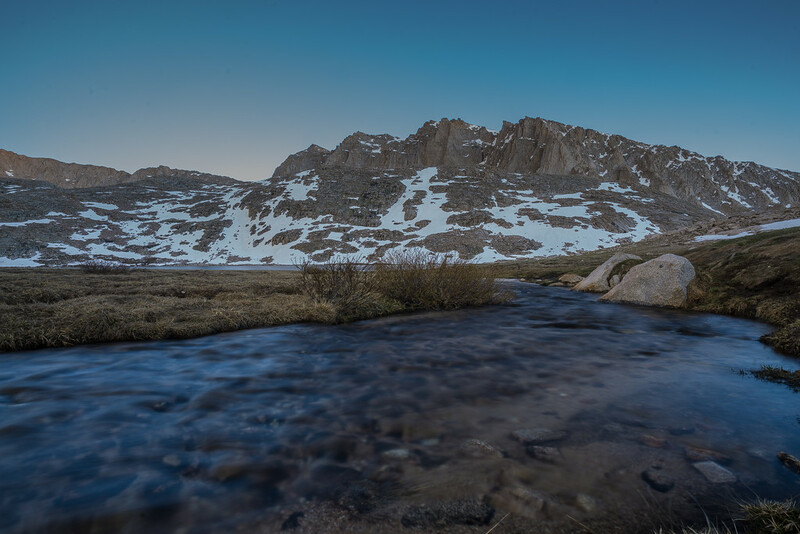 Below is a summary of big-ticket items I brought on my High Sierra Trail to Mount Whitney Trip, it's not a comprehensive list of every little thing I brought. I also did this trip very early in the season, therefore, I may have some extra snow gear you may not need, depending on when you embark on your own trip. 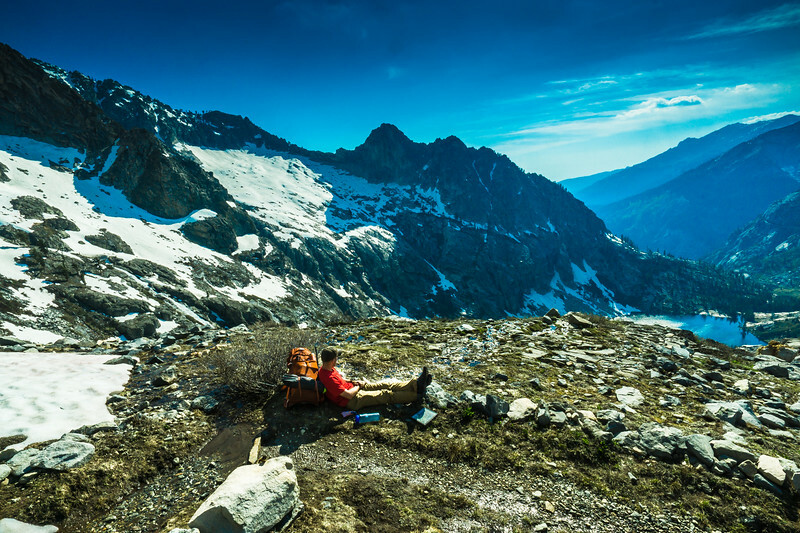 Any week-long backpacking trip will take a lot of logistical planning. Gear, water, food (packing your bear canister for 1 week) etc. 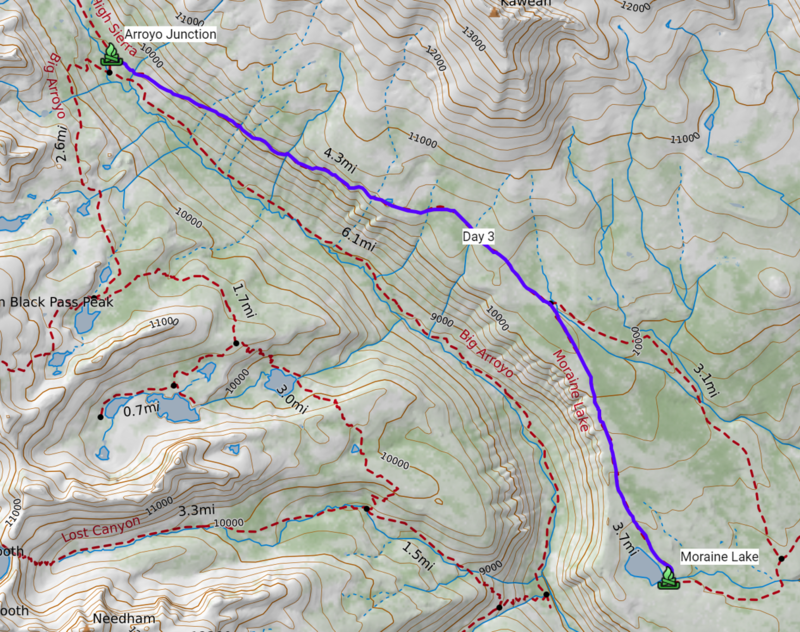 This post will focus on the logistics of getting to and from the start and finish of the hike. 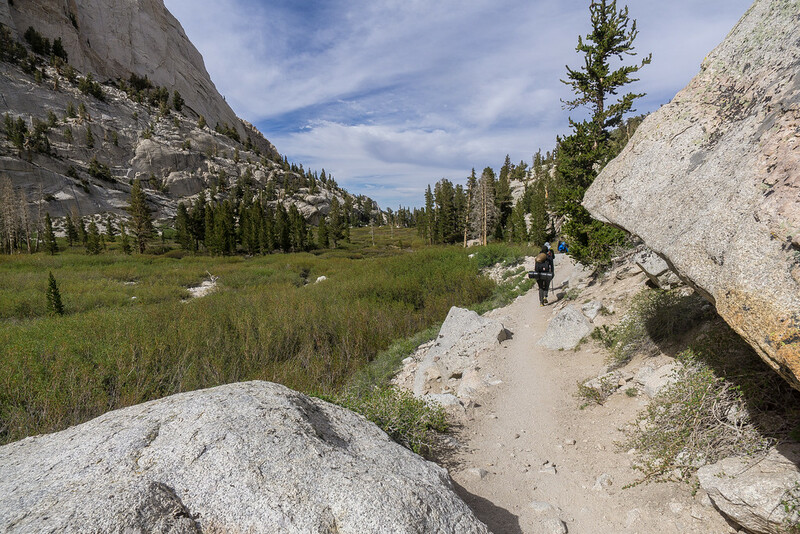 The High Sierra Trail to Mt Whitney is a straight through hike with no easy way connecting the start and finish. There are many ways to skin the cat on how to get to and from this hike, I am going to focus on what we did for our trip. If you have any other ideas that you were able to execute please reply and share to this discussion. My buddy and I decided to both drive up and meet at Lone Pine. 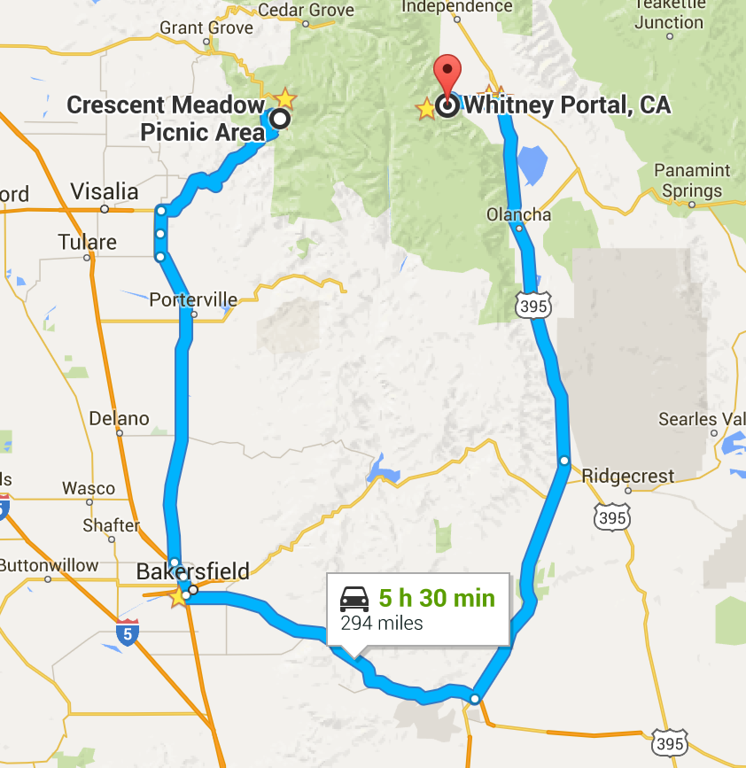 We would leave one car at the end of the trail and then drive to Sequoia National Park together in one car. After the trip, we would drive back to Sequoia to pick up the first car, which resulted in a lot of driving for me after the trip. So what are the options for leaving a car on the east side of the Mountain? Well, unfortunately when I went (June 2016) there was no long-term parking in Whitney Portal due to construction on the road leading into Whitney Portal. So I would have to leave my car in Lone Pine instead. Option 1: Lone Pine Chamber of Commerce, apparently you can leave a car here. Because of my work schedule and not planning for this early enough I never got a hold of the chamber of commerce to ask about leaving my car there. Not sure if its free, cheap or expensive. Option 2: Dow Villa Motel, was very accommodating after talking with them. They have a large parking lot and I asked if I could leave my car there. They told me the parking lot was only for customers. Knowing that I would want a place to stay after the last of the hike ( 15+ mile day) I asked if I booked a room for one night could I leave my car there for a week and they agreed. For $80 I got a clean room with two beds, and a bathroom and shower, and a week of parking. This ended up working really well for me, and my Jeep Wrangler was safe and sound when I came back a week later. It was also, of course, great to stay in a bed after a week in the woods, before an 11 hour day of driving. 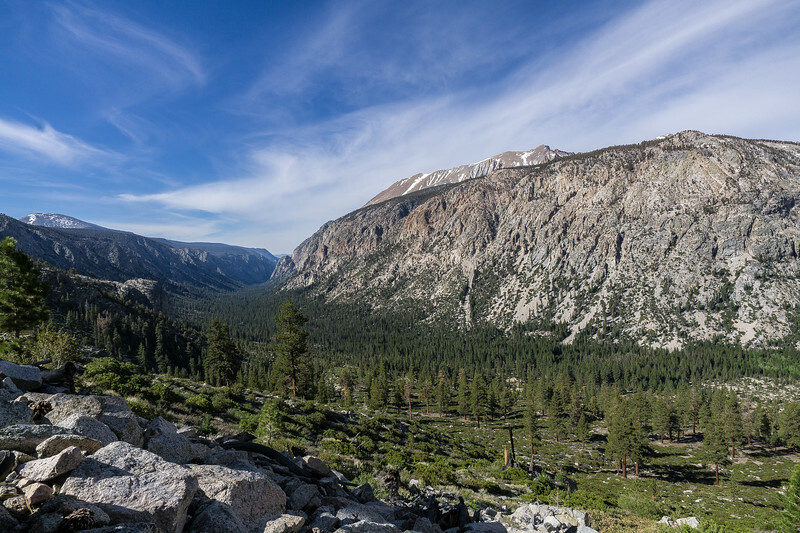 Since we were driving from Southern California after work on a Friday, we were not just dropping one car off in Lone Pine and driving straight to Sequoia. 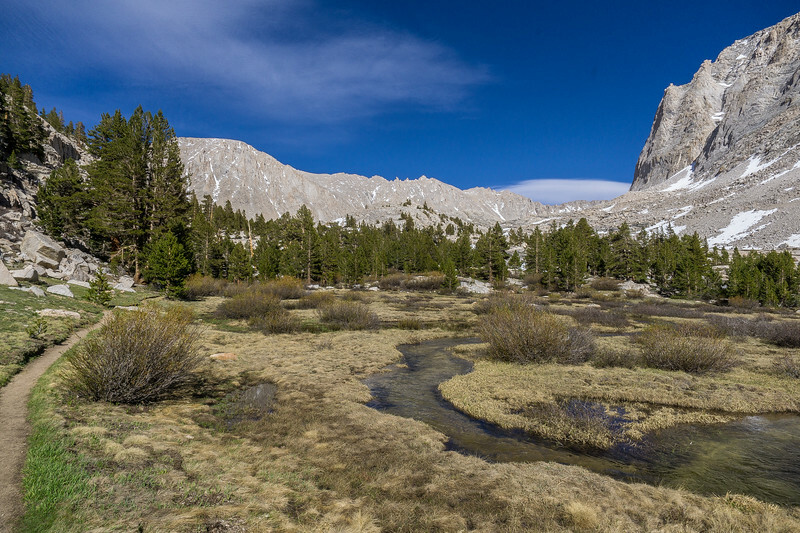 We met up in Lone Pine on Friday night and were picking up permits and starting the hike the next day on Saturday. 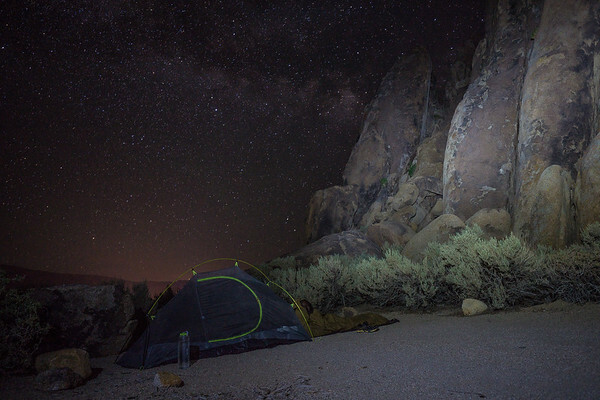 Friday night we camped for free in Alabama Hills, free public and in between Lone Pine and Whitney Portal. If you have the time to camp a night in Alabama Hills, I highly recommend it, its absolutely beautiful and did I mention its free? The cool thing about Alabama Hills is a whole lot of Western and other movies have been filmed there. Also, the stars at night were absolutely amazing! 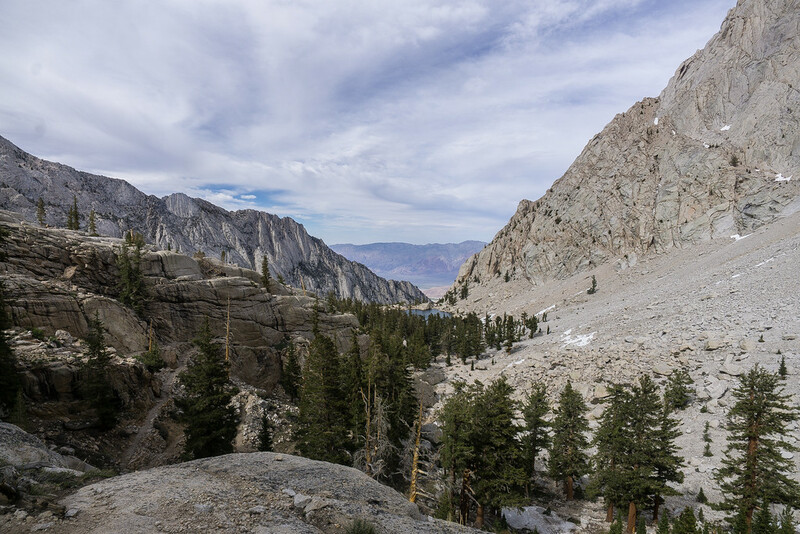 One last thing to think of if you cant leave your car in Whitney Portal and you have to park in Lone Pine is that there is no public transportation from Whitney Portal to Lone Pine. I also looked into Uber, and it looked like there were no Uber options between the too. Also when we did finish the hike, I didn’t have cell phone service until I got back to Lone Pine, so relying on Uber wouldn’t have been the best option. We ended up meeting some guys on the Climb up to Whitney. 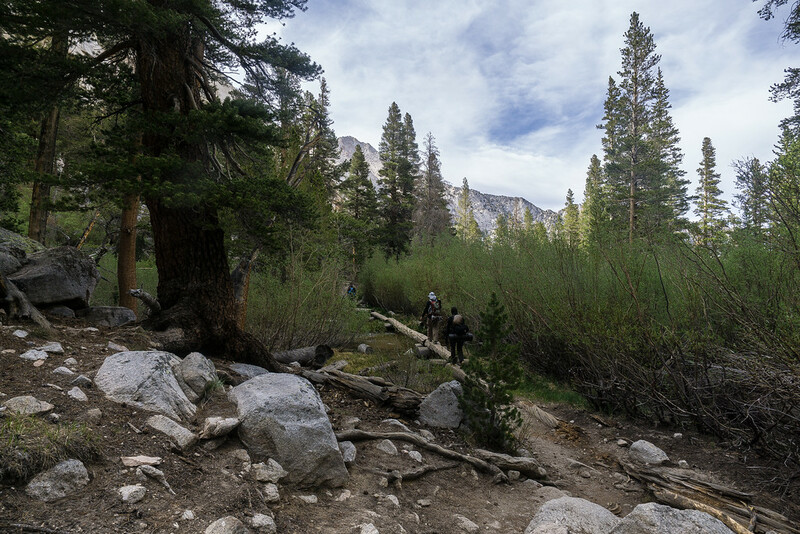 They were doing the day hike, and thus parked in Whitney Portal and graciously offered us a ride back to Lone Pine. We hiked down with them, and the extra company was fun! One thing to note when picking up your permits is that if you can not pick up your wilderness permits by 9 am you should give them a call the day before to schedule a late pickup. Any permits not picked up by 9 am will be given out first come first serve unless you call ahead. I did this and picked up my permits around noon. 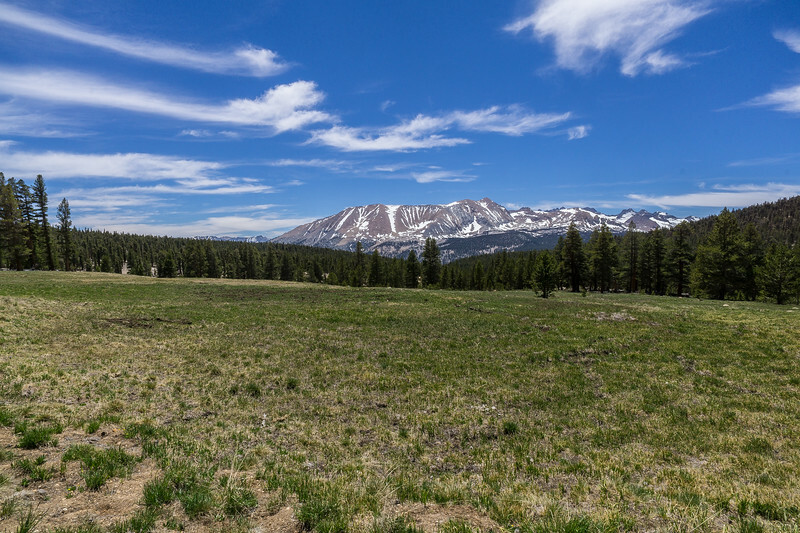 After you pick up your permits you will be ready to go, drive down to Crescent Meadows to park your car and begin your hike. Once you park at Crescent Meadows, make sure you clean out your care before you start your hike. This is a bear location, and if you leave any traces of food in your car while you are gone for a week backpacking a bear may break in to try and get the goodies. By clean out your car, this means anything with a smell! After finally arriving at Sequoia National Park and dealing with the logistics of planning a through Hike, we had our permits in hand and were ready to hike! Unfortunately, we did not start hiking till 1:30 pm so it was a late start. We woke up a little later than planned in Alabama Hills, met some nice climbers the night before and stayed up talking about, bears, marmots, and self-arresting technique. We also stopped for lunch/breakfast a little longer than planned at Chick Fil A in Bakersfield….. 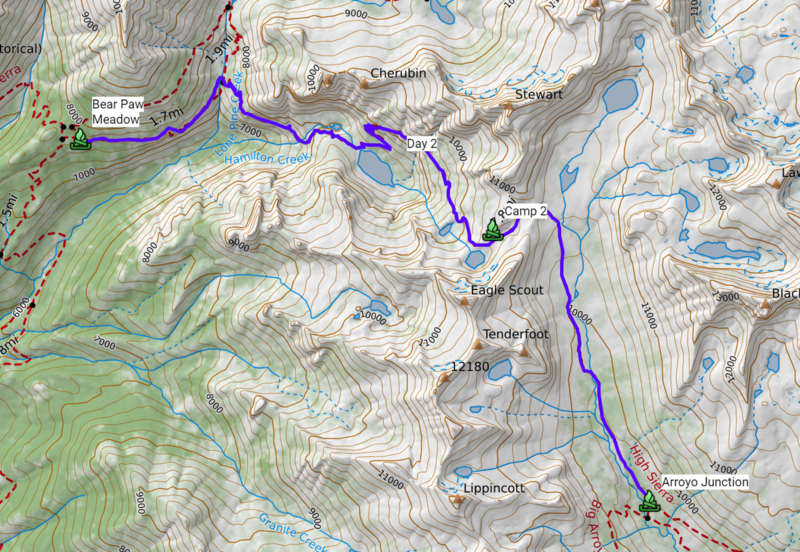 The plan for day 1 was to hike 11.4 miles from Crescent Meadows to Bearpaw Meadow. 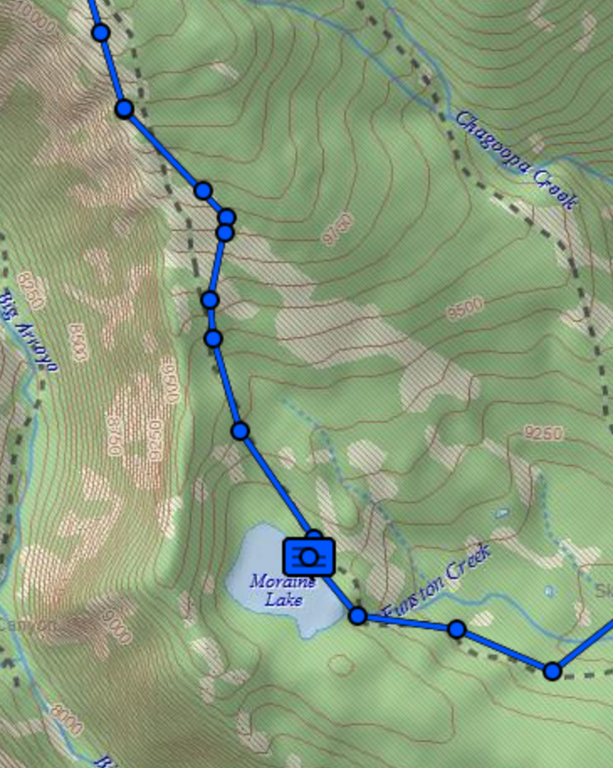 You can grab the day one map here on Caltopo . 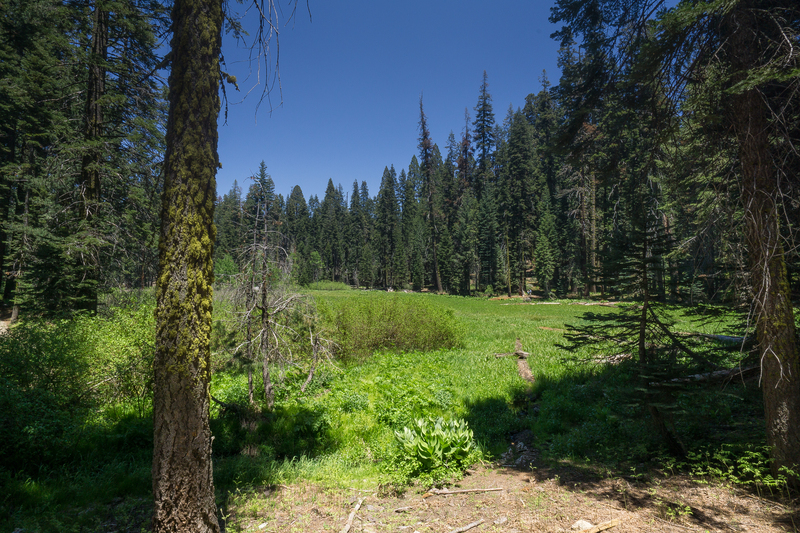 Day 1 of the hike starts in beautiful Crescent Meadow surrounded by Sequoia trees. 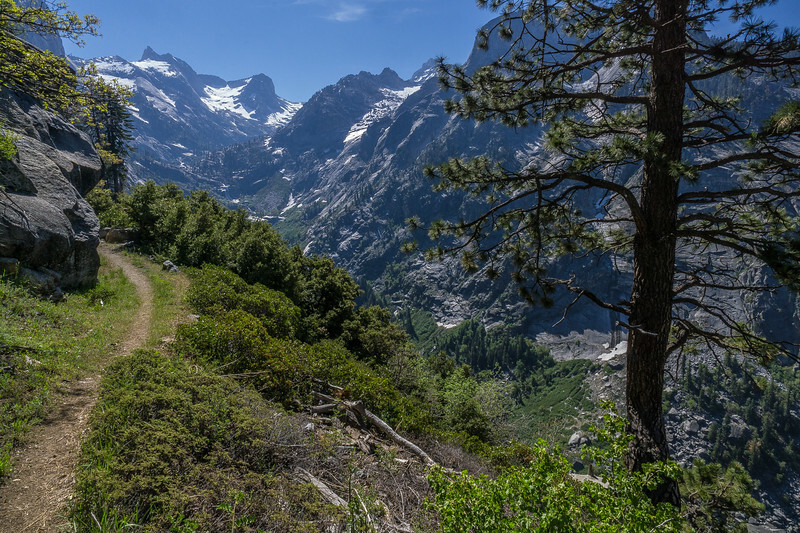 The trail immediately starts to climb slightly as you rise above the meadow and out of the trees and onto the beautiful mountain ridge on the High Sierra Trail. As you rise out of the trees, you are immediately overtaken by beautiful views of the valley below, and snow-capped mountain foreshadowing whats to come. Being the first day of the hike our legs were fresh and we were happy to finally be on the trail. Most of the day follows the ridgeline presenting magnificent views. Once out of the meadow, there were no crazy steep climbs that I remember laboring over, but it was an 11-mile day, so we were feeling toward the end of the day. 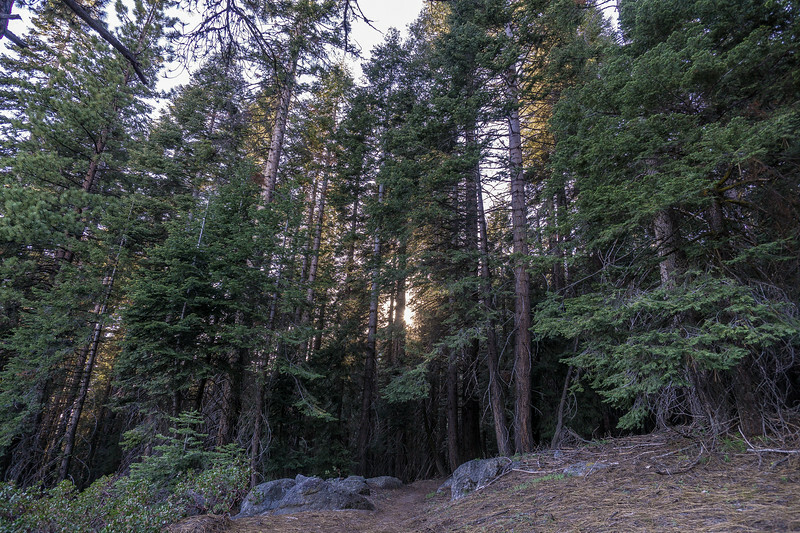 The trail travels in and out of the forest, ranging from a shaded pathway to un-shaded ridgeline throughout the day. 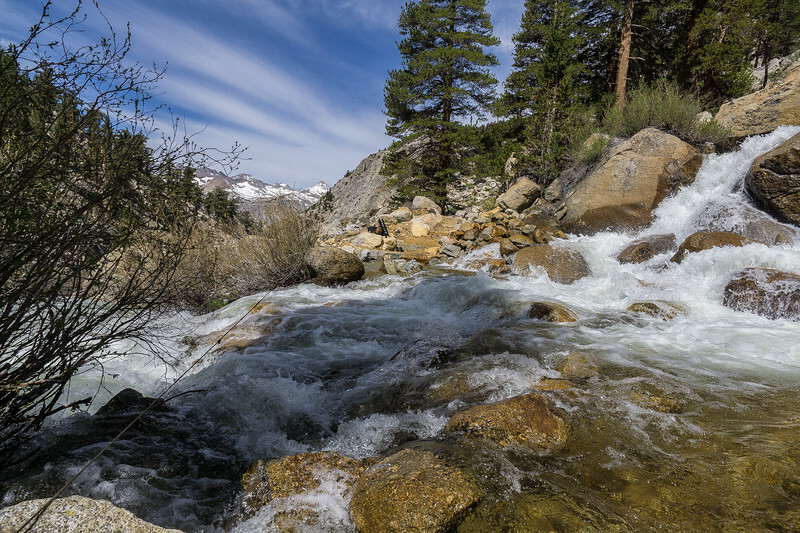 Since we went early in the season, the heat was not bad, but you may be drinking a lot of water during the summer, but there are enough streams to not worry too much about water. One trend for our trip that was not too bad on day one, but signs were showing, was the strength and height of stream crossings. 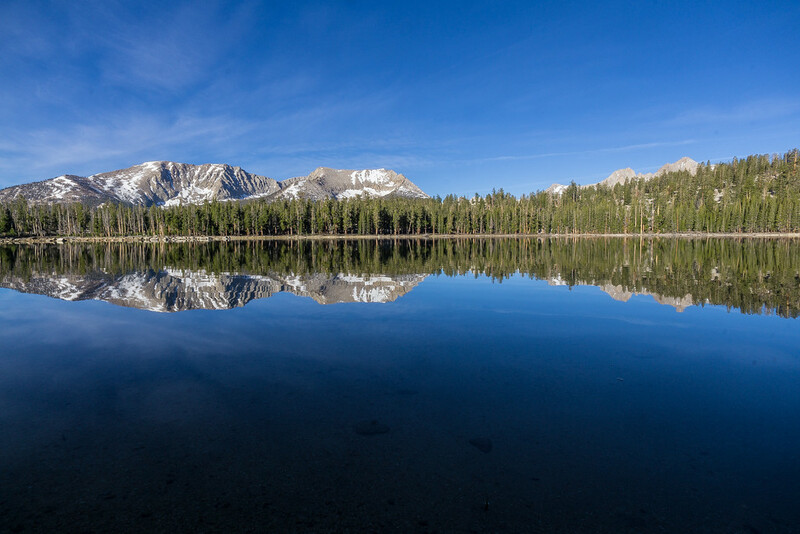 A week or so before the Sierras were slammed with wintry conditions and luckily for us the weather this week was fantastically warm. 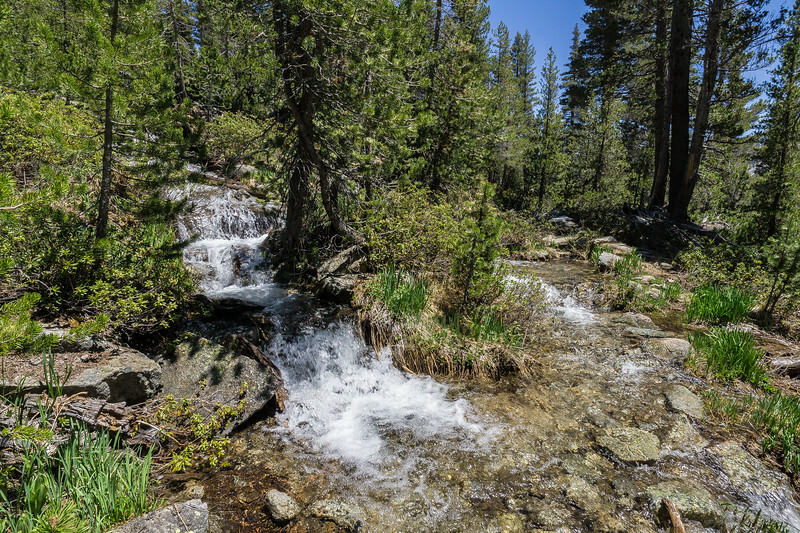 As a result, you will see the streams were high and flowing, and we more often than not had to cross at locations off the trail to try and stay dry. Some times this led to a little more work on our end like climbing. The last mile or two of the hike I was getting tired and was ready to make it into camp for the night. Our late start did not help, and I was pretty hungry at this point. 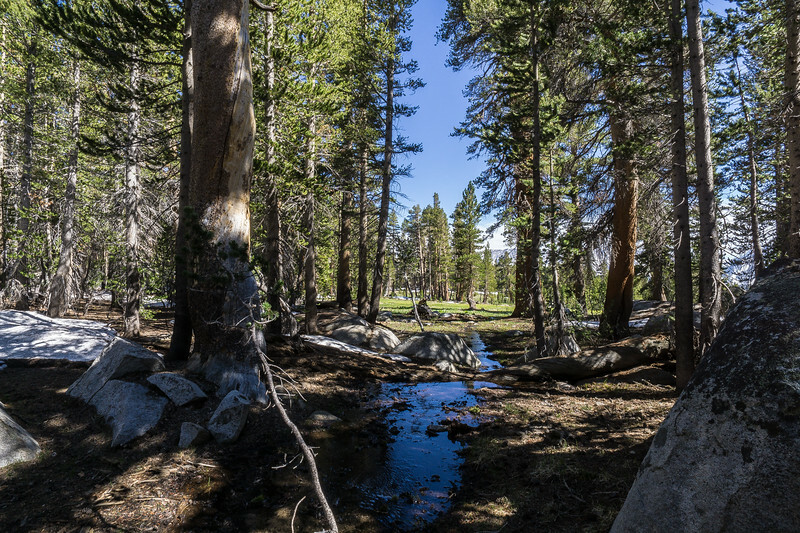 When we arrived at Bearpaw Meadow, there were multiple ready-made campsites, which included fire rings, and big green bear lockers. It was getting dark when we arrived, and this was the most crowded camping location of the trip. 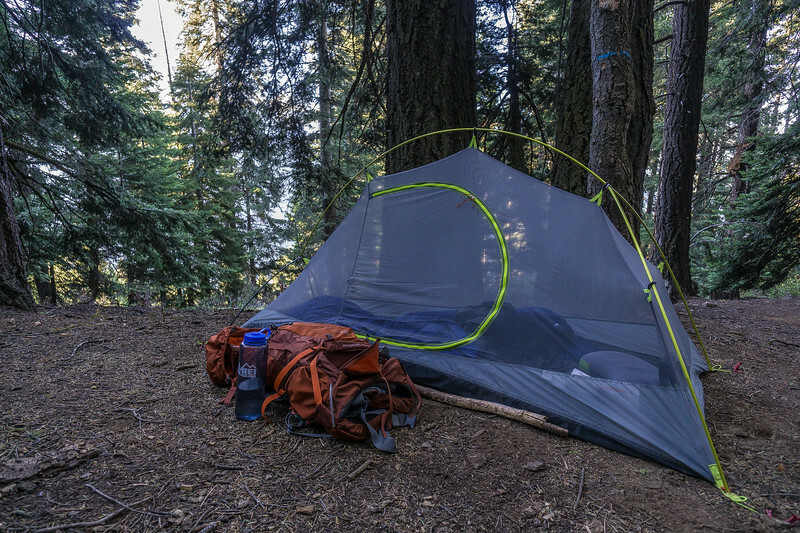 During the more popular summer months, I would recommend getting an early start and staking out a campsite early. Despite my use of the phrase “most crowded” there were probably only 4 or 5 other groups ranging from 1-3 people. It was still a quiet nights sleep, and we still felt solitude. There was also a faucet for water and pit toilets here. The faucet water came out white, but our water purification system easily turned the water clear, and it tasted fine. The first days, rest was well deserved. 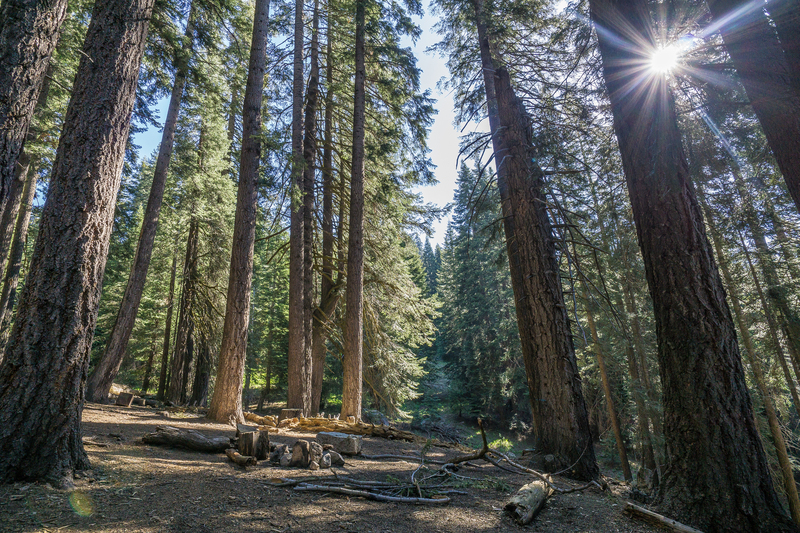 After some much-needed rest after day 1, we woke up in beautiful Bearpaw Meadow with the sun breaking through the pine trees canopy. 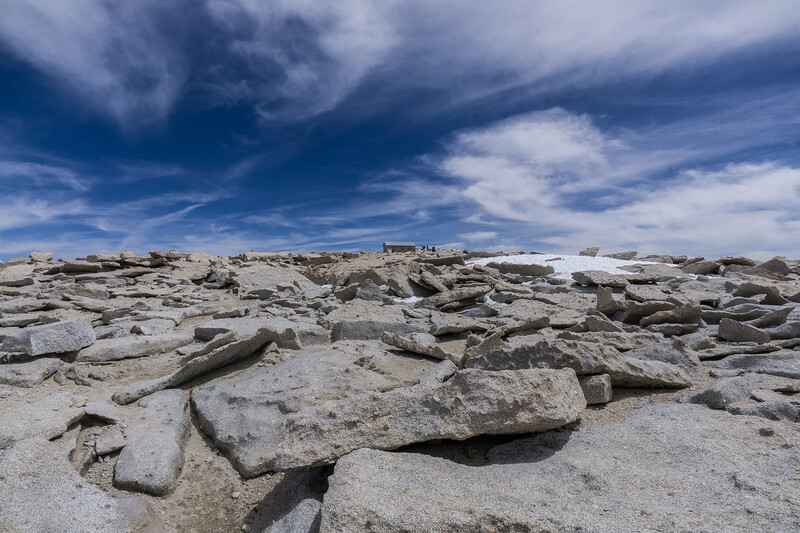 Day 2 of our High Sierra Trail to Mt Whitney trip was when things started to get a bit challenging. 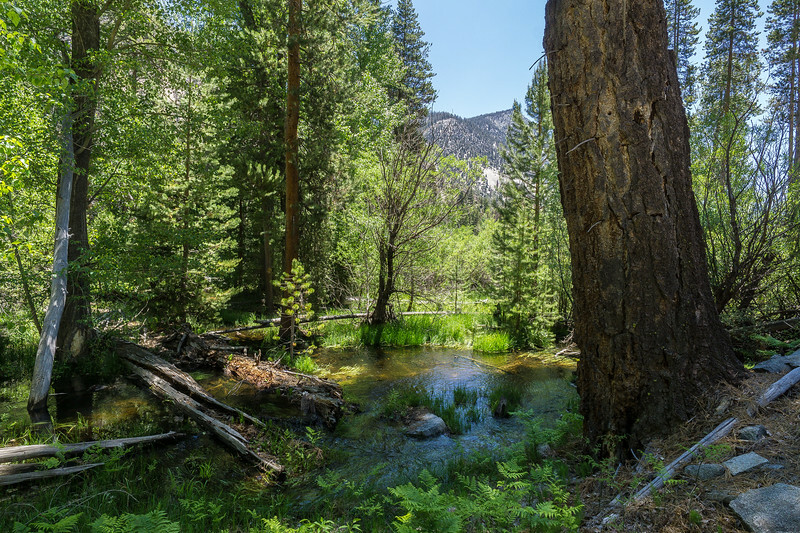 Our goal was to wake up in Bearpaw Meadow and hike roughly 11 miles to Arroyo Junction. Looking at the map below, you can see our proposed hike for the day, and see where we actually stopped. We made it maybe a little over halfway before it got late and we ended up making camp 2 on cliffs in Kaweah Gap above Precipice Lake. 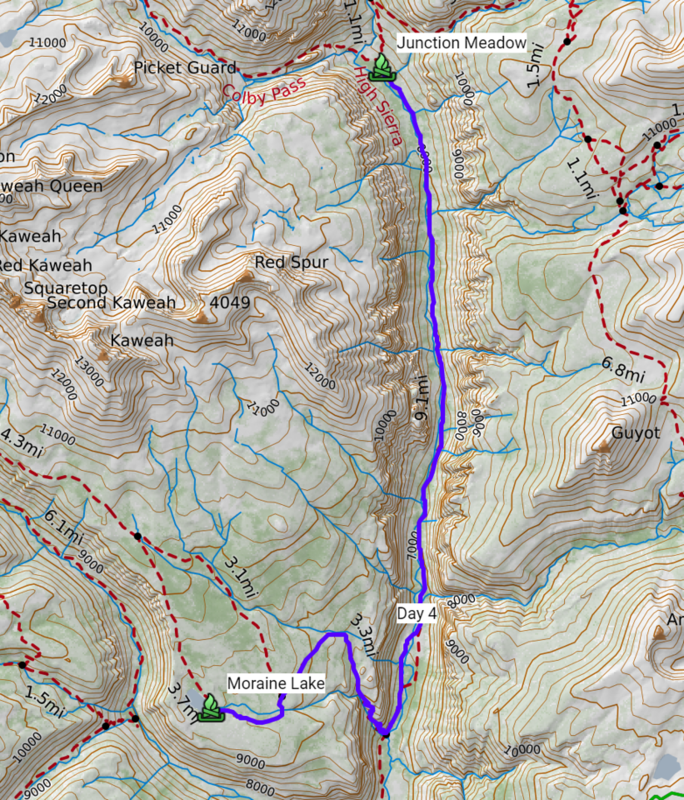 Download the map on Caltopo here . After waking up in the pine forests, day 2 started out similar to day 1. We hiked out of the forests and started hiking along the ridgeline. Today the Snow capped mountains were closer and calling my name, I was getting more excited the closer we came. Hiking along the trail, which is a little steeper than the first day, we came to a man-made bridge over an awesome ravine. Because of the snowmelt, the water below in the ravine was raging. Needless to say, I was very happy that there was a man-made bridge at this point, this would not have been fun to climb down, across and back up. We moved higher and higher, slowly getting it closer to a large waterfall we could hear in the distance. 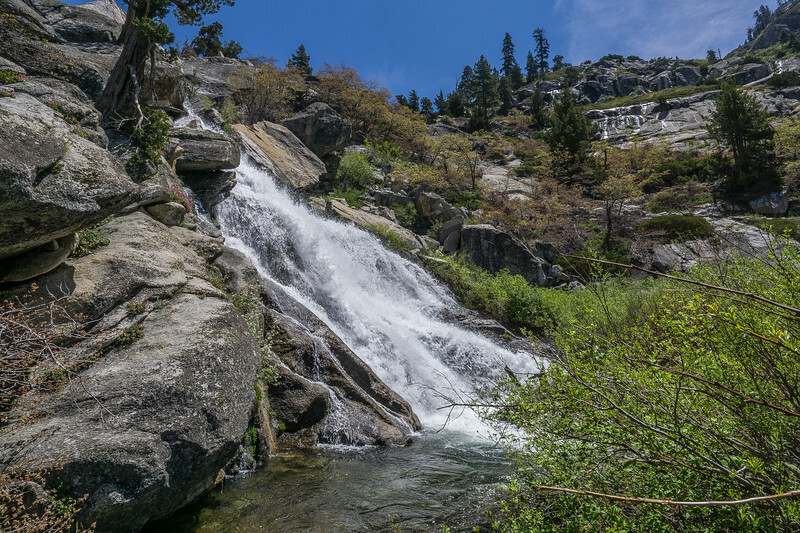 As we approached the waterfall we could tell we were getting close to Hamilton Lake, and the snow-capped Kaweah Gap. When we got to the waterfall, we had to stop and think of our route across. The point at which the trail came to the edge of the water was not an ideal place to cross. The water was deep due to the melting snow, it was moving quick, had a large waterfall drop to the right and another waterfall upstream to the left. Deciding not to cross close to the big drop on the right, we moved left upstream and climbed some large logs across, while simultaneously getting cooled off from the mist of the waterfall on our left. 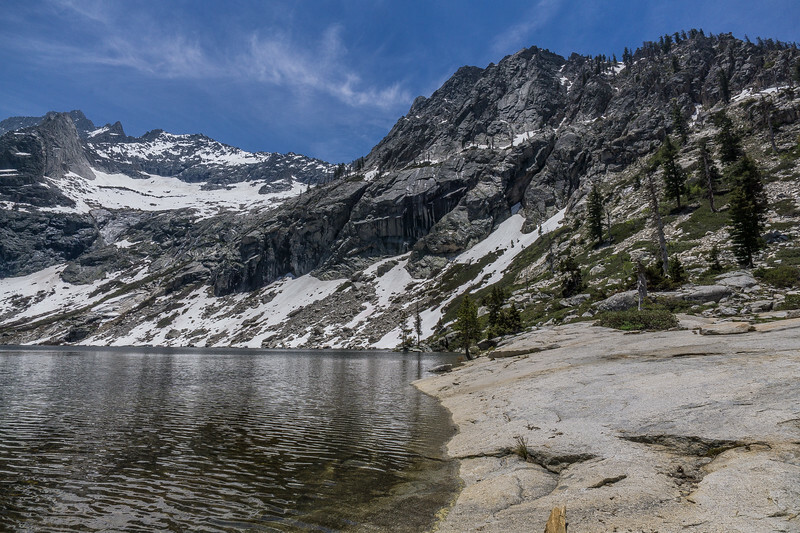 After successfully crossing the water feature and staying mostly dry, we came up to the little brother of Hamilton Lake. One view that I just could not get over that kept repeating itself the entire trip, were the little mountain runoffs in the background. As a result of the snow quick snow melt, there were mountain streams running off in just about every direction of every mountaintop. Hamilton Lake’s little brother was beautiful but it Hamilton Lake was absolutely stunning. The crystal clear water in a bowl in the sky, surrounded beautiful pine trees, snow and mountain streams, Hamilton Lake was stunning. 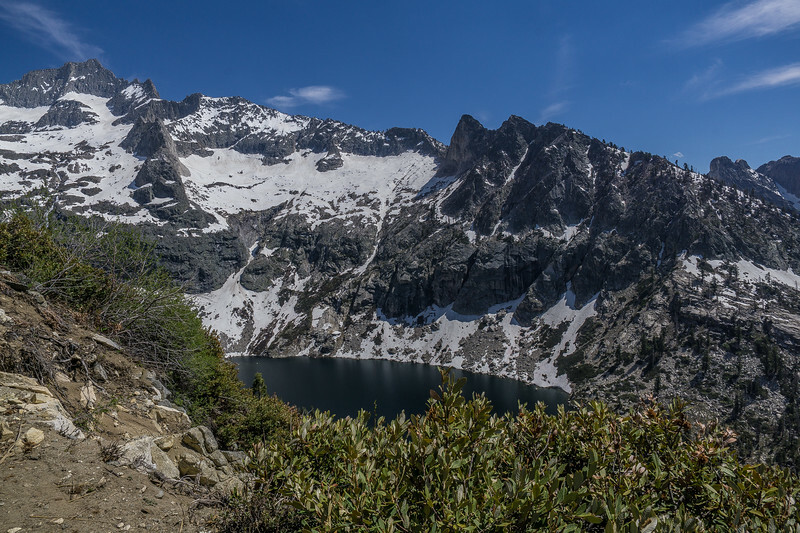 As we neared the lake, we hiked right up to the edge, kicked off our shoes and took off our packs. It was a beautiful day, and I soaked my sore feet in the icy cold water. We stopped here for a long lunch and topped off our water sources by filtering the mountain lake water. The long break was awesome and I honestly didn’t want to leave, this may have contributed us not making it through the snowfields high above the lake. After the amazing break, we got our packs back on and went back to the trail. Again the trail went right up to the waters edge at the tip of the lake. Due to the water's height from the snowmelt, there was no obvious way across in order to stay dry. At this point of the trip, I was beginning to wish I brought some sort of light water shoe for all the crossings we would encounter. We followed the small stream from the mouth of the lake down a little bit and found some logs to climb across…we got lucky again. 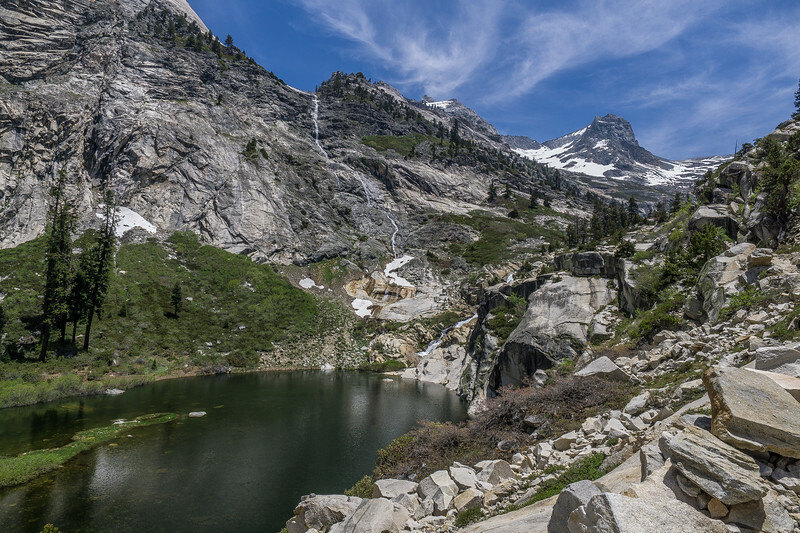 Once you cross the mouth of the lake the trail begins to wind up the sides of the mountain bowl very very quickly. As we climbed up the side of the bowl, things became a bit more technical as we began to hit ice and snow. The climb did treat us to some even more amazing views of Hamilton Lake down below. Following the trail brought us to the infamous tunnel. There used to be a steel bridge at this point over a ravine until it fell down years ago. The trail was fixed by blasting a small tunnel in the side of the mountain. 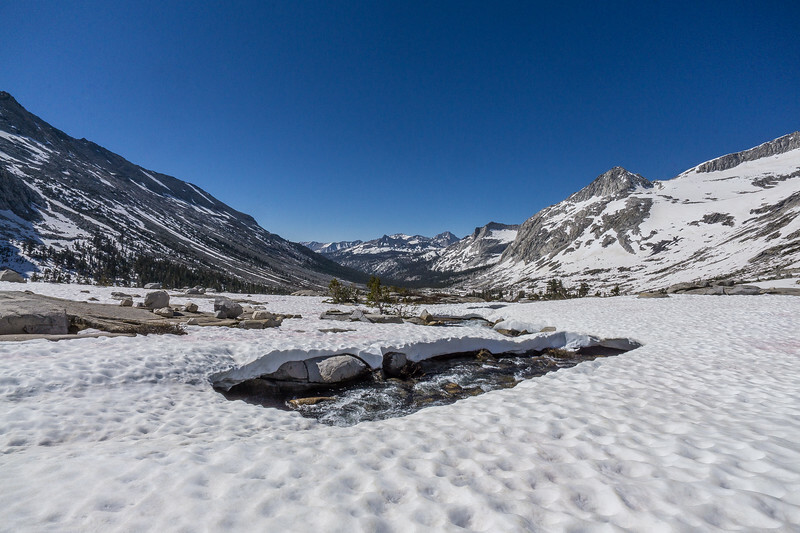 "5/20 – Trail passable to Hamilton Lake with patchy, slushy snow the last two miles up to the lake. 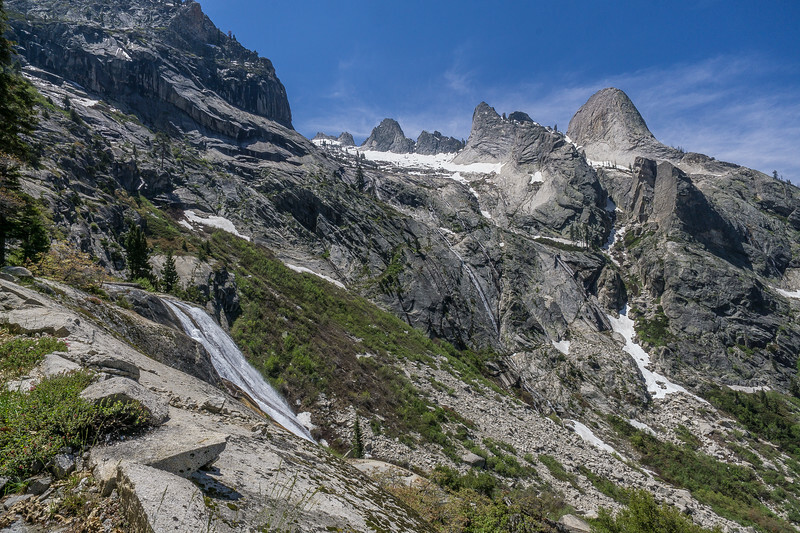 From Hamilton Lake to Precipice Lake extremely dangerous. One group armed with ice axes, crampons, ropes, etc. and alpine winter experience, turned around after attempting an ascent to Precipice Lake from Hamilton. Extreme caution advised"
The tunnel became my first piece of dangerous trail on this trip and the first of this day. I guess I should clarify, the tunnel park was easy we just walked right through. 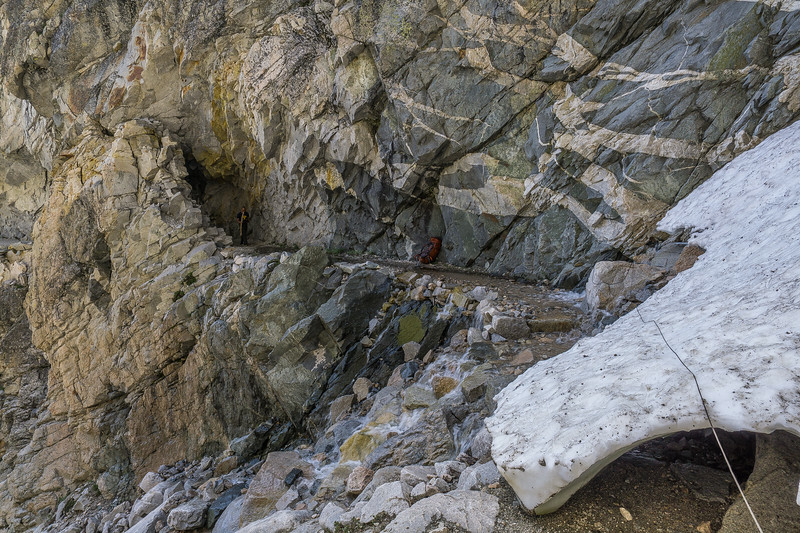 Its right after the tunnel there is a snow chute. The picture above does not do it justice, and it may not look that dangerous to you, but the snow which is more like hard ice completely blocks the trail. Below the ice is pretty much a vertical rocky cliff. At this point, we contemplated turning around and calling the trip. We dropped our packs in the tunnel and I went to investigate it with my ice ax in hand. Being an optimistic person, I thought to myself maybe I can just chip the snow away with the ax and clear the path enough to walk by…. That was not an option, I took one swing at the bottom to try and ship a piece off and nothing really budged. Maybe it was an option if I had a few hours, but that was not going to fly. Instead, I took a length of 550 cord out of my pack and tied it to my ice ax. I free climbed the rocks below the ice chute to the other side. 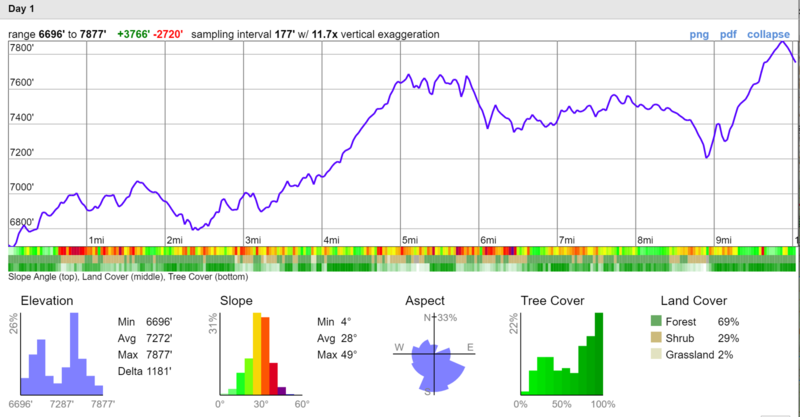 Despite the drop below, I am sure this is a nothing climb for serious climbers but I am not a huge fan of heights. I made it to the opposite side, tied the 550 cord into the ice ax and anchored it in between some rocks. I threw the line over the snow chute and we used the rope to ferry our gear across the chute. Once all our gear was across, my buddy tied the rope around his waist and then climbed below the chute and across as I did earlier. 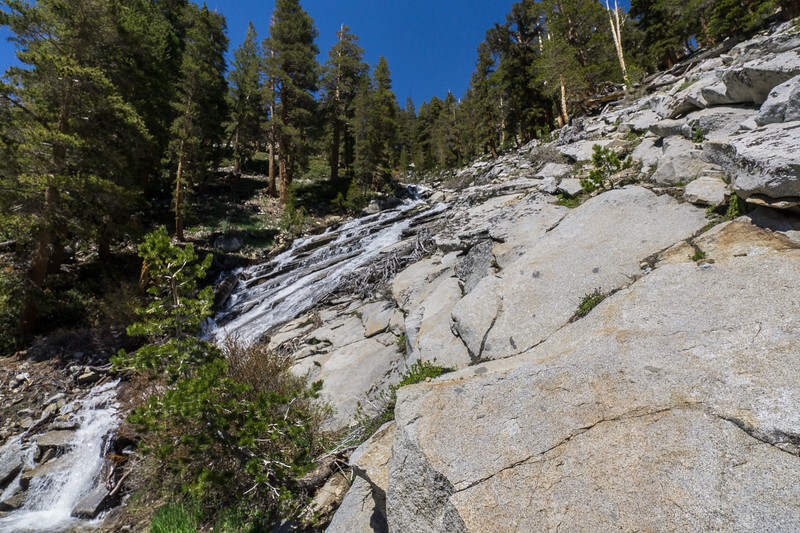 This slowed us down quite a bit on our climb up toward Kaweah Gap, and after the free climb and shuttling our gear, my adrenaline was pumping a bit. 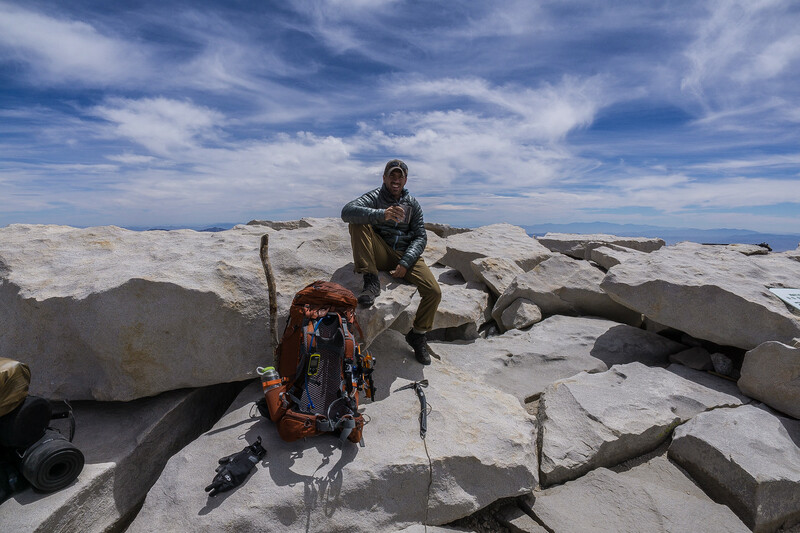 Once we crossed it felt great, and I was ready to continue our push toward Mt Whitney. There was no turning back now, I didn’t want to make that crossing a second time. As mentioned earlier this was the first of the day's challenges. The higher we climbed the snow/ice became more abundant. It looked like every slippery slope would drop you right into the mouth of Hamilton Lake. In the snowfields high above Hamilton Lake, I attached my crampons for the first time and used my ice ax for a secure hold on the side of the steep ice cliffs. 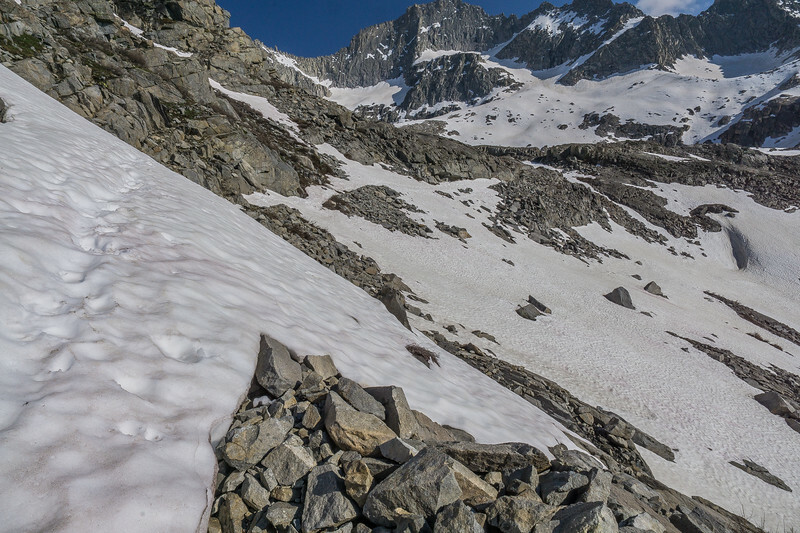 As we passed through multiple steep ice fields the day wore on, the trail was buried in snow and we just kept climbing toward the gap. This was our first day above 10,000ft and I was becoming exhausted. On this climb there came a point where I began counting 6 steps, then stopping for a count of ten. I continued this 6 step, ten-second rest routine to keep myself going and to push on. The higher we climbed the lower the sun came. 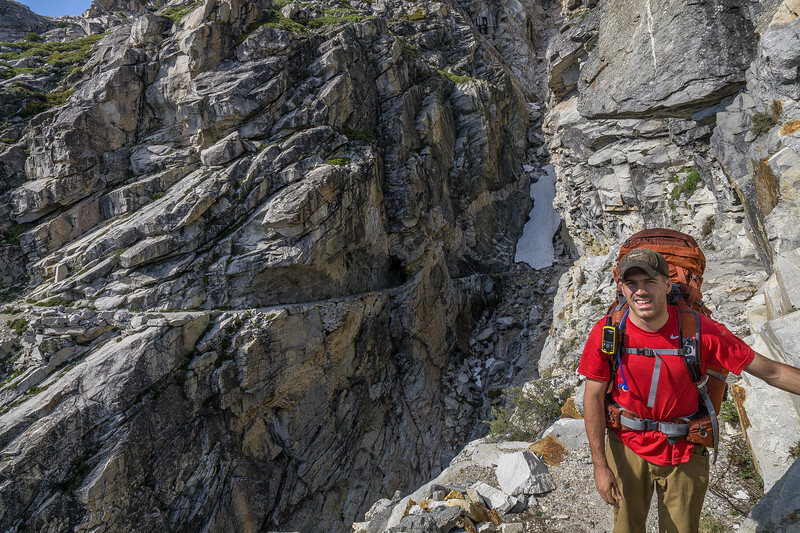 Without a trail to follow, we took the path of least resistance and made it tot he cliffs above Precipice Lake. At this point the sun was low, and we looked for the flattest piece of ground we could to set up camp high on the mountainside. 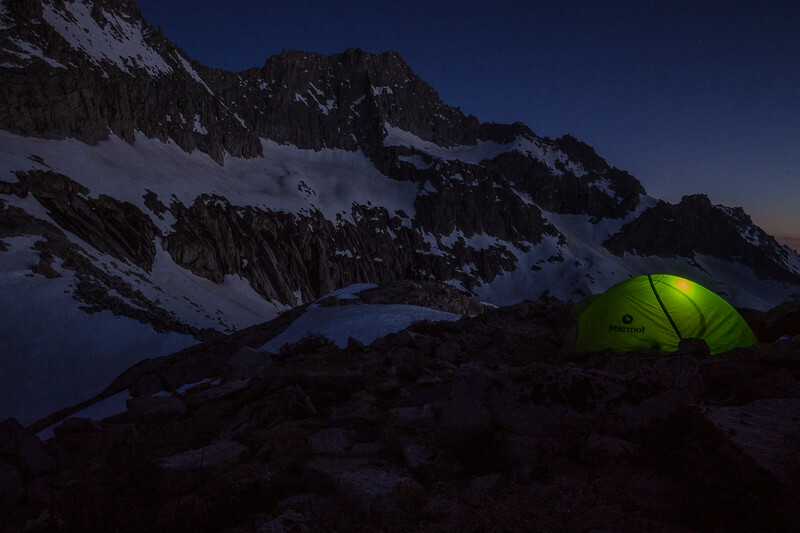 We prepared for a freezing night this high into Kaweah Gap, but the weather was calm with a light 4 mph wind. It was peaceful, on the side of the mountain and the views were absolutely stunning. 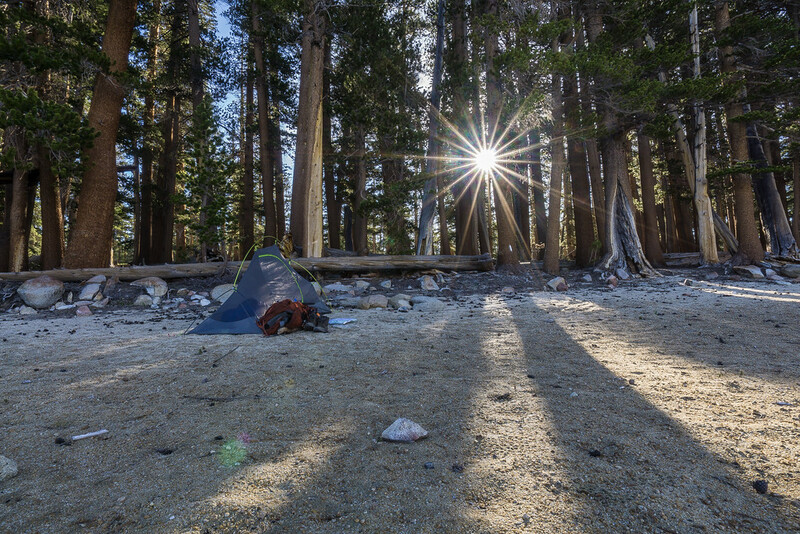 This was one of the most beautiful most remote campsites I have ever experienced in my life. On day 2, we did not make it to Arroyo junction as planned. Day three started with us waking up on top of the beautiful Kaweah Gap. Today was supposed to be a recovery day. We were supposed to be waking up in Arroyo Junction and hiking 8 miles to Moraine Lake. 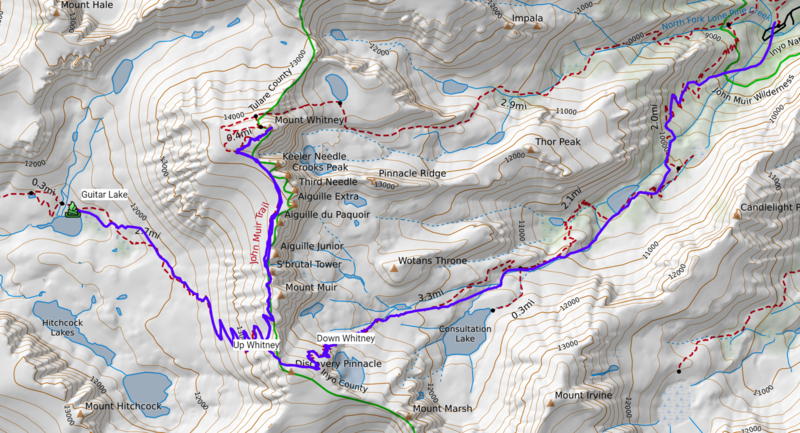 We did not quite make it to Arroyo Junction and were waking up at Camp 2, and would have to hike to Arroyo Junction and continue past to Moraine Lake. 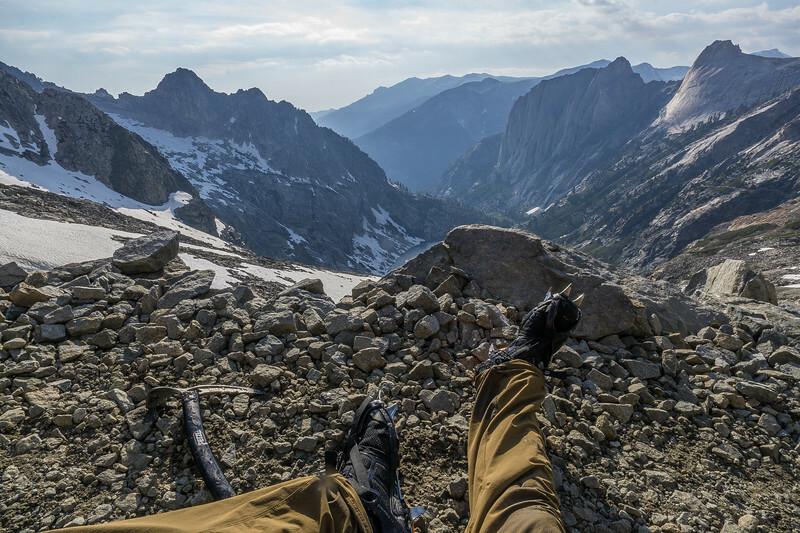 We woke up high above on a finger which points toward Precipice Lake. We never saw Precipice Lake the day before, so I left my pack at camp and walked down the finger of the cliff to get my bearings and make sure Precipice Lake was in fact where I thought it was based on my map. The lake was there but was completely frozen over, but I confirmed my location. 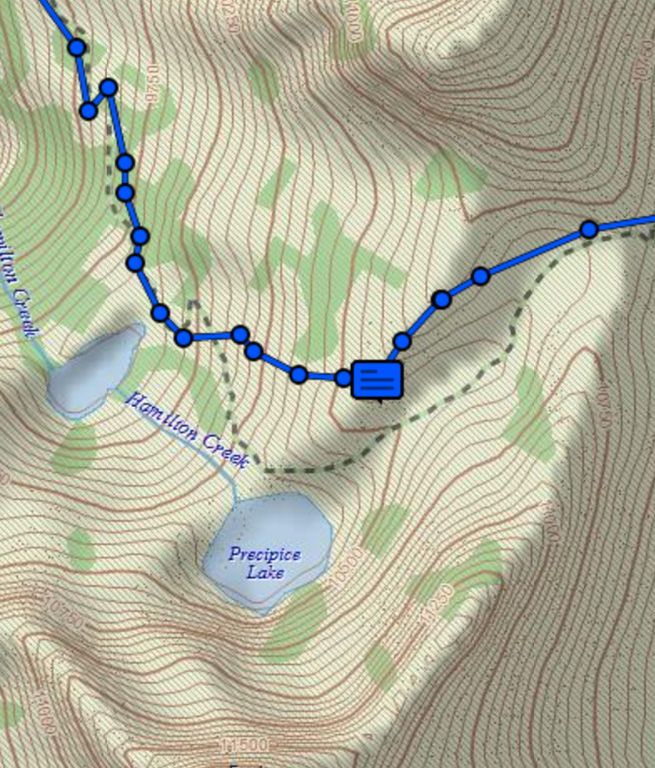 I could not see this map while hiking, but my Delorme InReach recorded our path for my family. 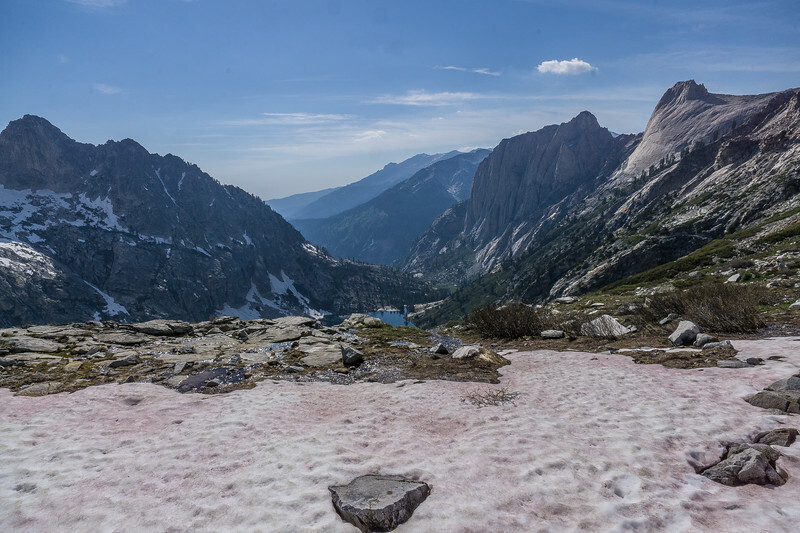 Below you will be able to see how we climbed up the west side of the finger pointing toward Precipice Lake since the trail was covered in Ice and snow. The message box icon is where we set up camp last night. Despite the lines on terrain markings on the map clipping above, the east side of the finger was pretty damn steep and covered in snow. The snow was extremely icy, and we were trying to get into the valley to the east in between the two fingers safely. We decided to hike up, staying on rocks and off the snow and see what we could from the top of the finger and try and find a safe route down. The snow was rock hard this early in the morning and more like straight ice. 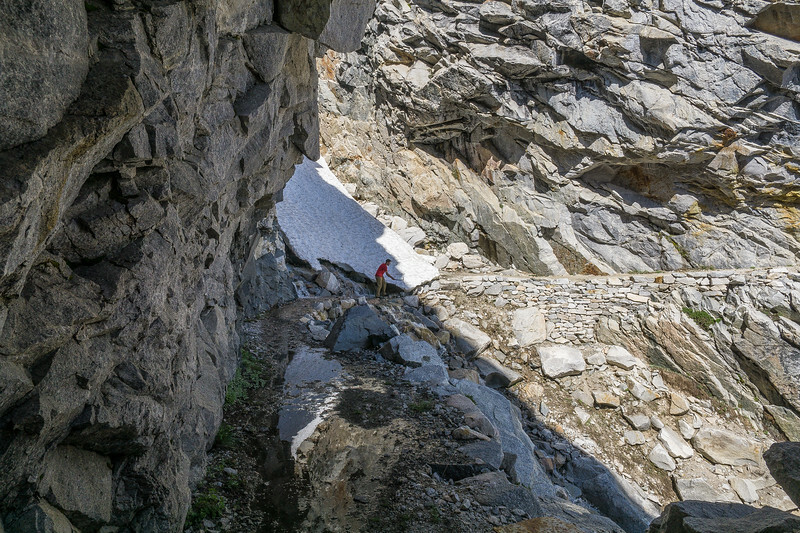 Looking down, glissading was our only option but as you can see in the photo below all the ice chutes went straight into rocks…. There was one particularly steep section with a small patch of rocks right below. We decided we could climb down to this small patch of rocks and then glissade down from the small patch of rocks to the valley between the fingers. I tied my trusty 550 cord to the head of my ice ax and buried it to use as an anchor. I took my pack off and safely climbed down the 550 cord to the patch of rocks below. My buddy then pulled the 550 cord back up and tied our packs one by one and lowered them down. Once all our gear was down my buddy dug up my ice ax and used both to climb down. Once we were on our small safe island of rocks, we glissaded down the rest of the way and hiked toward the gap. 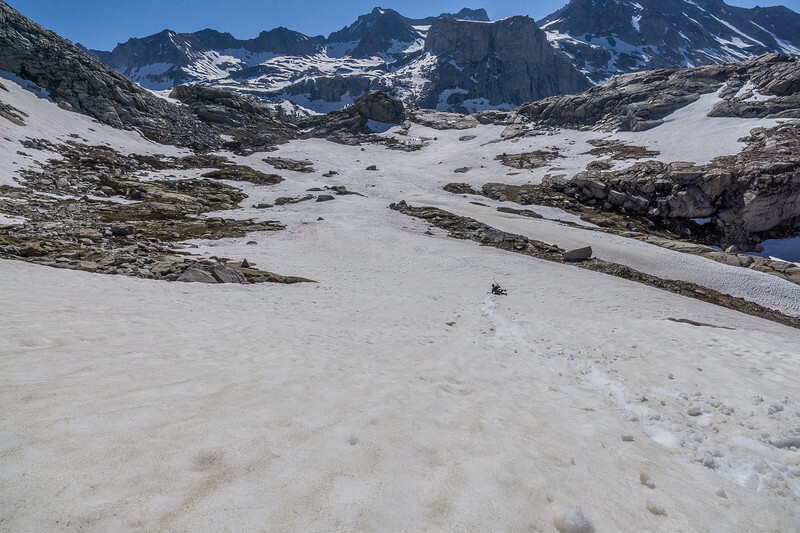 Once we made it through Kaweah Gap, we were standing on another slope we would glissade down. 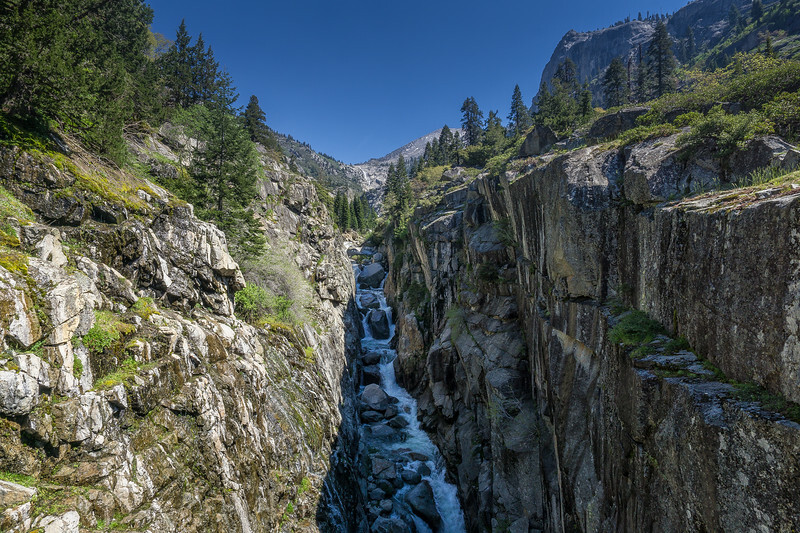 We had a beautiful view of the Big Arroyo surrounded on three sides by snow-capped mountains and beautiful semi-frozen stream leading to a pine forest in the valley to the south. Yesterday we didn’t eat dinner before going to bed; our bodies were exhausted. We stopped at the river to filter water and cook some lunch. After lunch, we carefully followed the river toward the pine forest south of the water. We had to keep a bit of distance from the river while following it through the snow; there were numerous ice bridges that could have broken and collapsed into the river. As we moved south toward Arroyo Junction, the snow dissipated and the river grew wider and stronger. As we left the snowy gap behind us and moved toward the pine forest. In the pine forest following the trail became a bit tricky at times. 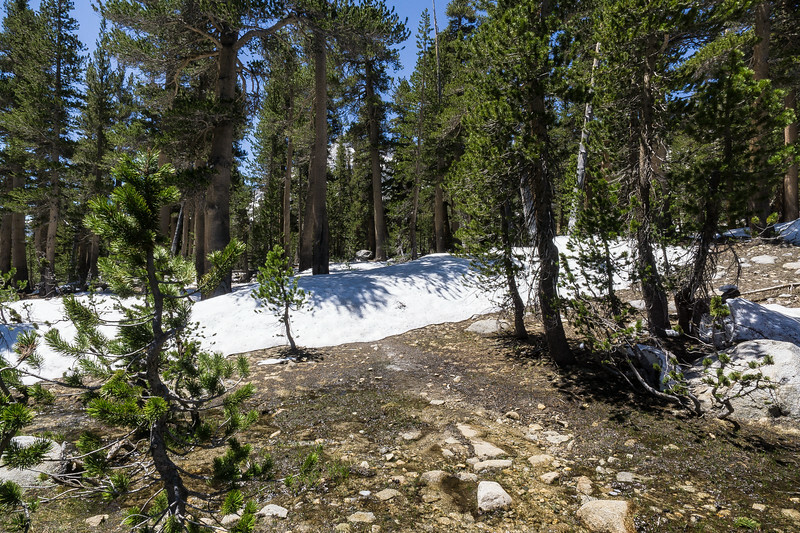 In the forest, visibility is greatly shortened due to the trees, and to compound that there were still large patches of snow in the forest. At times we would be following the path, and it would lead straight into a patch of snow 3-5 feet high! 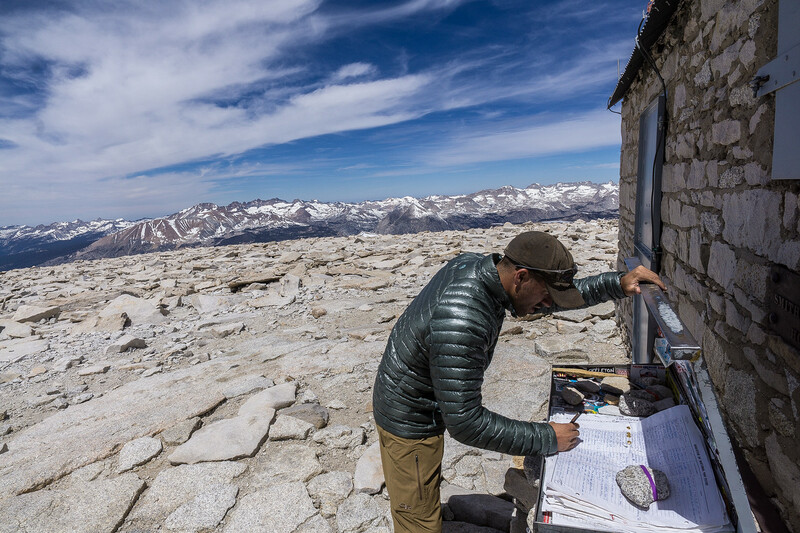 This is another reason why not to attempt this hike early in the season if you do not have honed land navigation skills, using a paper map. For the most part, the trail followed next to the river, meandering through the pine forest. As we followed the trail and the map, the trail eventually lead straight to the river, and then we could see it pick back up on the other side. The river was moving pretty fast and was a decent depth, not quite waist deep but deep enough to know I did not exactly want to get the wet…. We dropped our packs next to the river and took turns scouting north and south for a suitable crossing spot while the other guarded our gear from possible animals. After moving both North and South, we could not find a dry way to cross. Before crossing, I wanted to test the crossing without a pack on. I took my shoes and socks off and did a test crossing. I took about four steps before I turned around ran back out, the water was absolutely freezing and my feet physically hurt! I decided the crossing would need to be accomplished in both socks and shoes for warmth. I made the crossing got wet and dealt with my wet boots the rest of the day… If I do this hike again, I will definitely bring extra pair shoes for water crossings. After this crossing, we again found the trail, and the snow continued to dissipate. As we continued south, we made it to Arroyo junction where we should have been last night. We made it there at 1:25 p.m., and had another 8 miles from this point if we were to get back on schedule. We took a quick break, had some snacks and got ready to push out some quick miles to make it to Moraine Lake tonight. 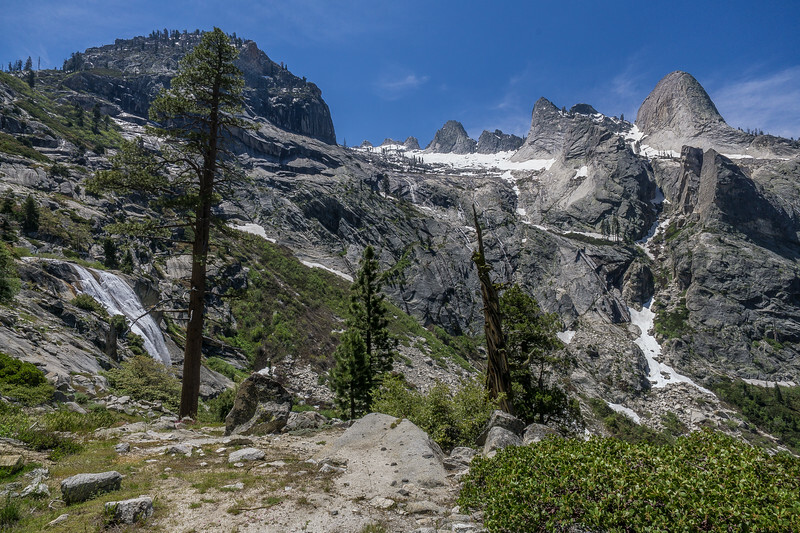 The trail from Arroyo Junction follows the east face of the valley and is a steady climb all the way to the Moraine Lake. The day three map can be downloaded from Caltopo here . 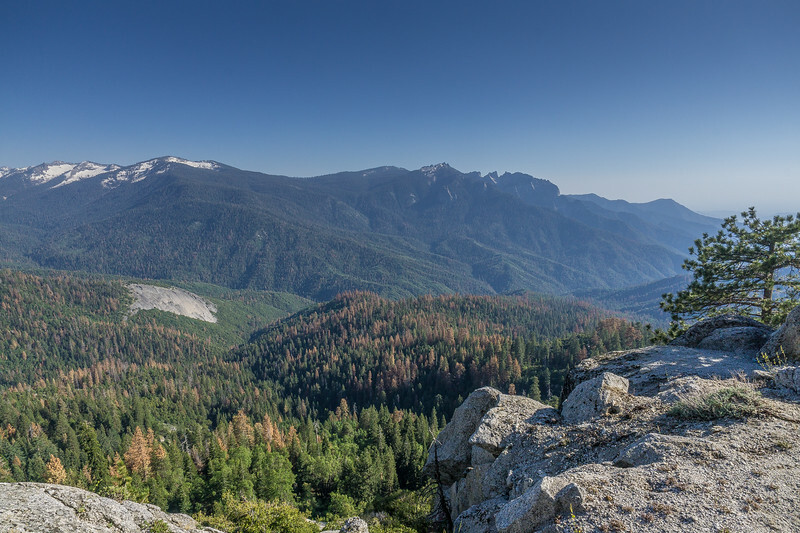 We climbed up the east face back out of the pine forest being treated to beautiful views below. This path was not too technical but was a constant climb. Along the way, there were multiple stream crossings, where we tried to stay dry, but my feet were already soaked, so I easily pushed through. Every little stream was a lot higher than normal levels due to the snow melts, and this continued throughout the trip. 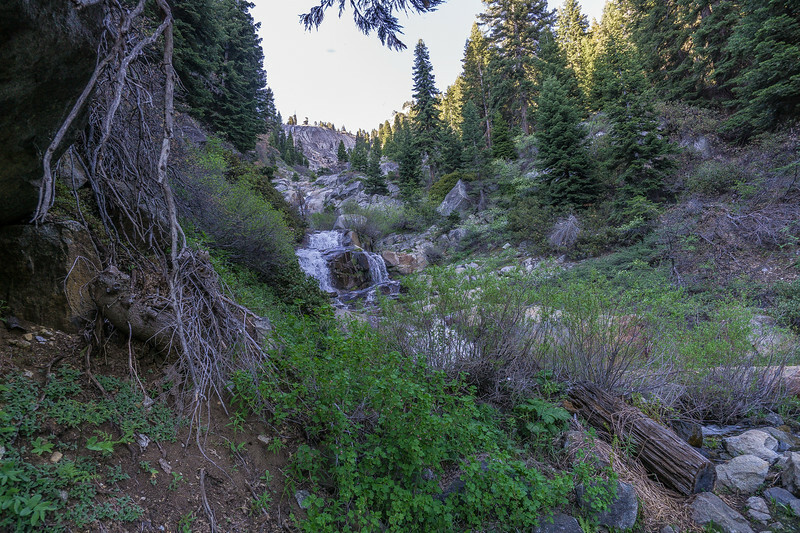 Once the trail started to level out toward the top of the climb we were treated with a handful of beautiful open meadows and streams. We were finally getting close to the end of our day, and Moraine Lake was only a short distance away. As the trail gently sloped down toward Moraine lake, we hit the last small problem of the day. Most of the trip we would lose the trail due to snow, this time there were just too many pine cones on the ground, and the trail was completely lost! 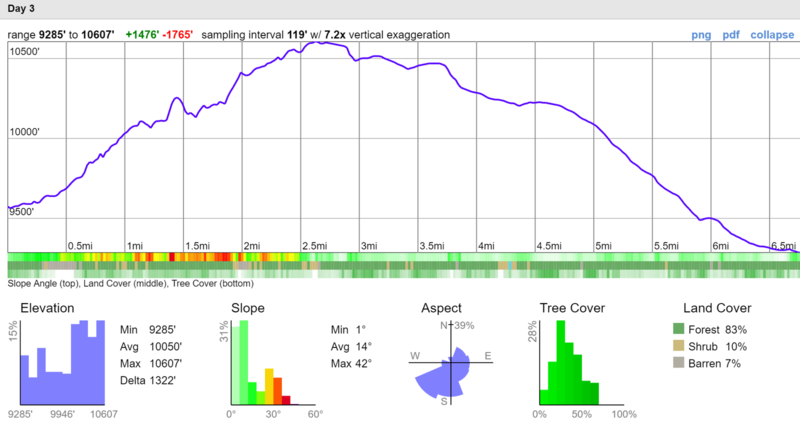 Below you can see where we went off trail a bit to the East due to the abundance of pine cones. Looking at my map, it was pretty easy to get back on the trail. There was a great catching feature to the west, the cliff…. I pointed my compass south-west and knew that if I hit the cliff, I went too far. We easily found the trail and continued on to Moraine Lake. We got to the lake just before 7 pm and it was absolutely stunning! The water was pristine, and the pine trees and mountain in the background just added to the gorgeous views! 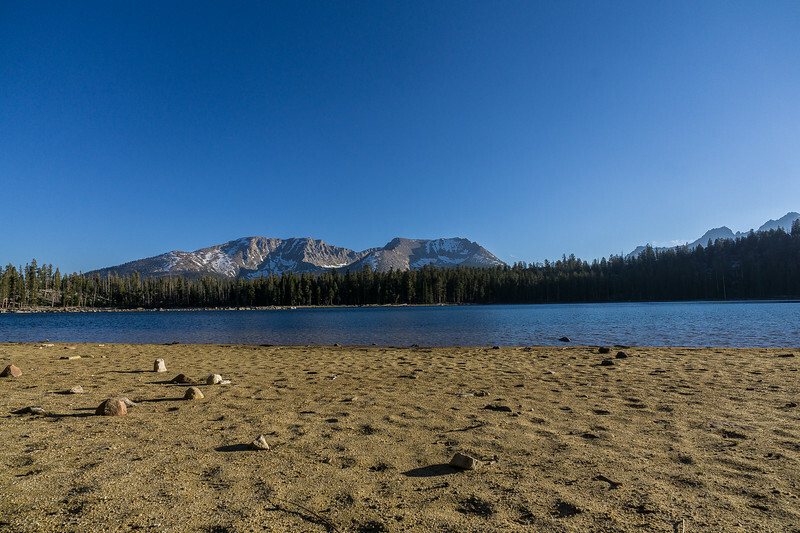 There was not another hiker at the lake, we had it all to ourselves and set up camp on the soft sand of the lake. There were a lot of mosquitoes, but they stayed high in the air and did not bother us. I feel like every campsite we stayed at during this trip became more beautiful than the last. But Moraine Lake was really at the top of the list, the solitude and beauty were everything I needed. I could have spent multiple nights there if I had more time off from work. I will definitely make a trip just to this lake in the future; it was awesome. In the middle of the night, I woke up to go to the bathroom, and of course, the stars were stunning. I stayed up and took a few pictures with the tripod that I lugged around the entire trip. This night at Moraine Lake, made carrying that tripod worth every pound it weighed. When we woke up at Moraine Lake we were treated to an awesome gift…. the water on the lake was absolutely still. The reflection of the mountains and trees in the lake was absolutely stunning. I always wanted a sweet lake reflection picture so this was a real treat to wake up to. Like I said in my last post, I would have been totally fine going absolutely nowhere this morning. 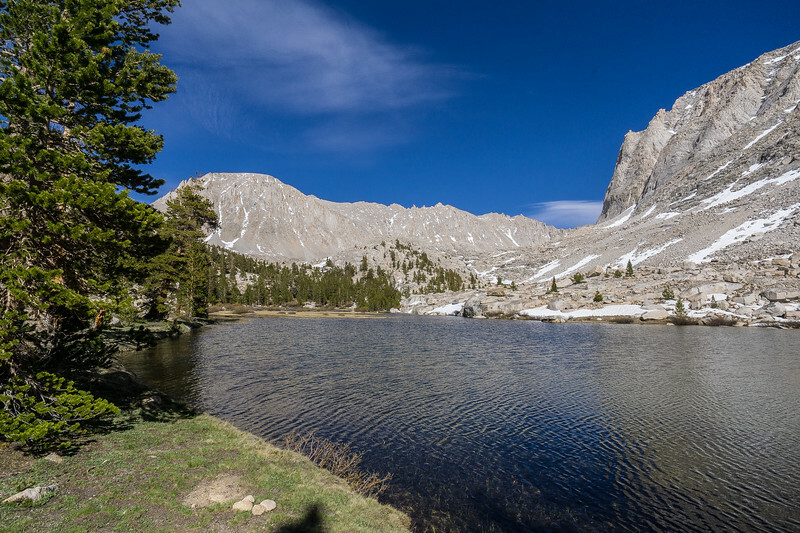 I did not want to leave Moraine Lake, but Mt Whitney was calling my name. The lake was not the only good view of the morning, the forest surrounding the lake was also stunning in the morning light. The morning of the 4th day started out with an easy hike down to some switchbacks that would bring us down to the Kern Valley. 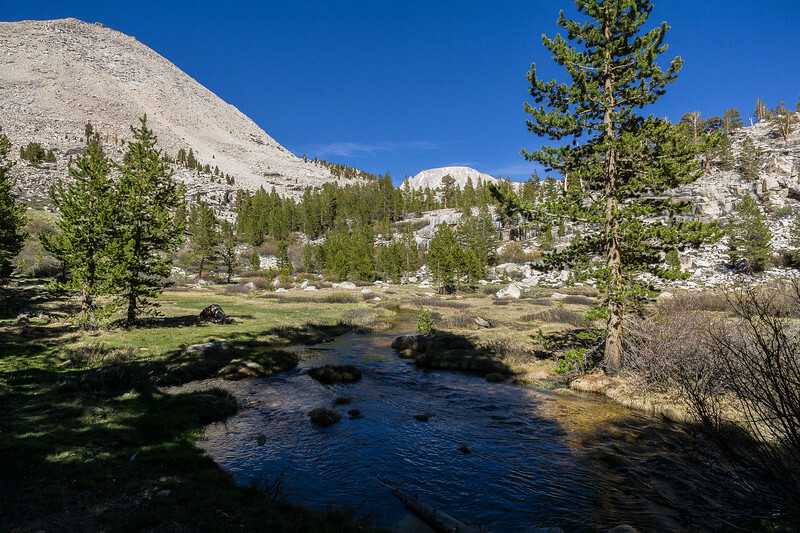 We would then follow the Kern River north to Junction Meadow. Today would be the day with the least amount of climbing. 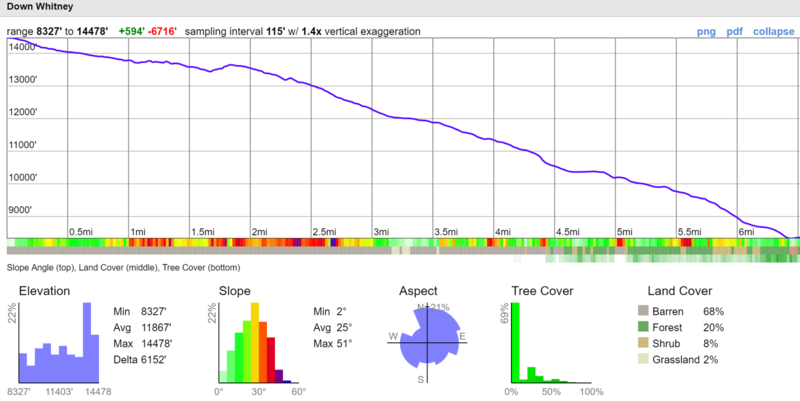 After yesterday not being the 8 mile rest day it was supposed to be, I was looking forward to a day of no climbing. Day 4 Map can be downloaded here on Caltopo . As we started to move toward the switchbacks we hit one section of trail that looked like a hurricane blew through. It looked like every tree was blown down, and there were mountains of logs piled up everywhere all over the trail. My day of “no climbing” started off with climbing over downed trees. We hit the switches backs pretty early and proceeded down toward the valley floor below. After the climbs the last two days you would think I would be excited about a downhill, but the constant pounding on my knees down the switchbacks made me eager to hit the valley floor below. 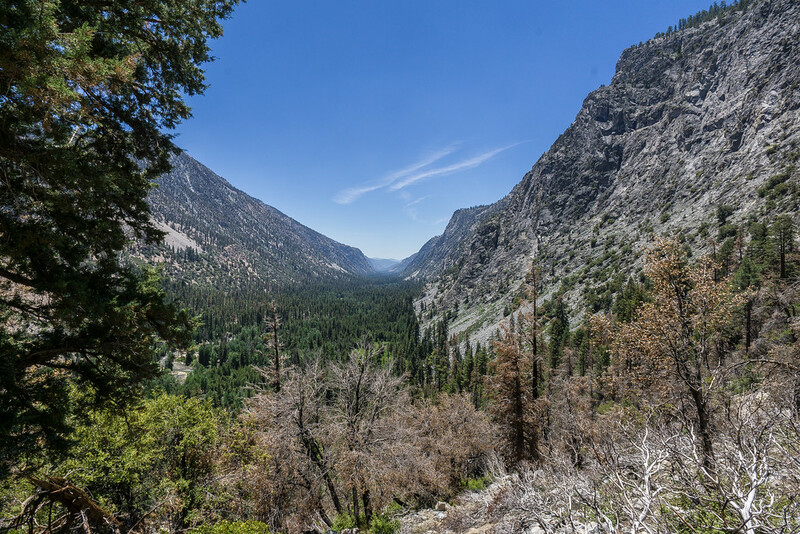 As we approached the valley floor below we were treated to some amazing views of the Kern Valley. Once we made it to the bottom of the Kern Valley my legs were relieved. Finally, some flat easy ground to give my body a little bit of a break. The Kern River was flowing with intensity and was overflowing at the point we reached the bottom. 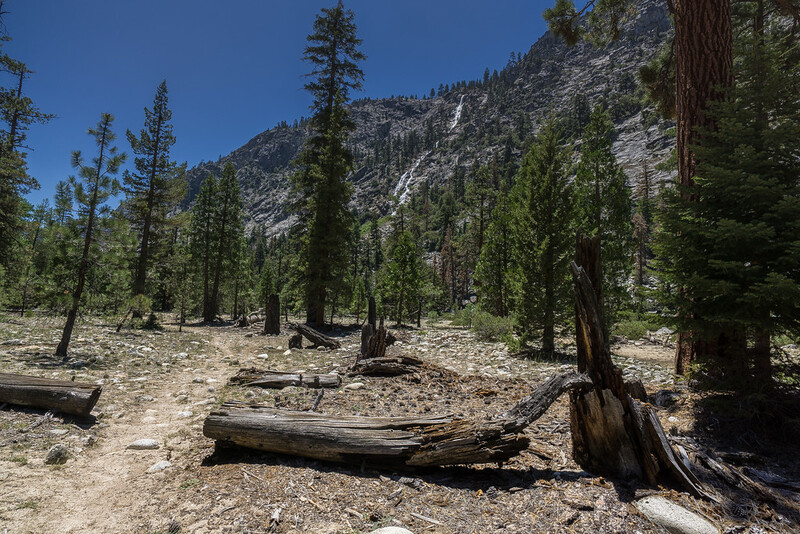 The trail down in the Kern River Valley crosses the Kern River once. Luckily for us, this one crossing involves a man-made bridge. The Kern River would have been downright dangerous if we had to cross without the support of a man-made bridge, this was a very welcome sight. For the most part, Day 4 was pretty uneventful. The trail was flat and we pushed hard to make it to camp early and relax. We hiked for an hour and then took a 5-10 minute break, we kept this pace for the entire day. 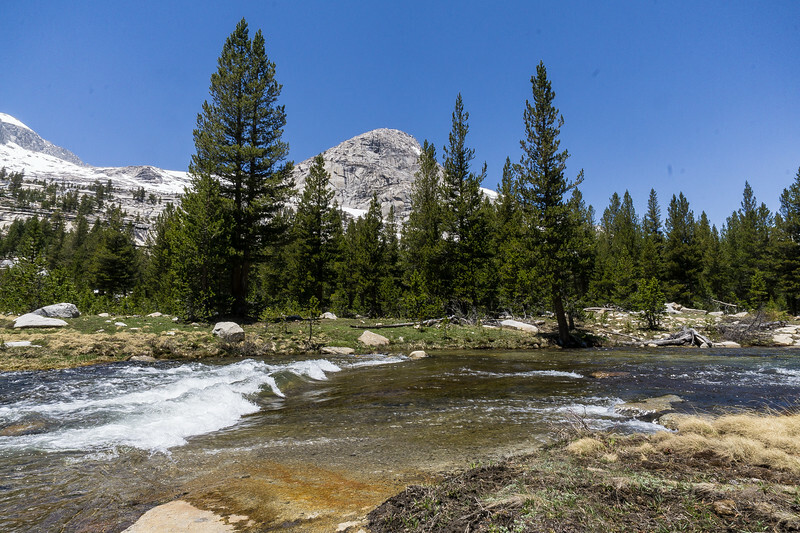 The views of the Kern River were great, the river was flowing over max capacity due to the snowmelt. When we were stopped on our breaks, I was amazed at how deep the Kern River at points. The water was crystal clear and I could see straight to the bottom and the depth was quite impressive. Unfortunately right before we made it to camp we lost the trail again. The Kern River was so high that it washed right over the trail, right before Junction Meadow. Again, I was fortunate that due to my job I have a lot of experience with navigating by map and compass. You can see our little detour in the map below recorded by my Delorme. This is the point in my article that I pitch the Military Grid Reference System (MGRS) over latitude and longitude. 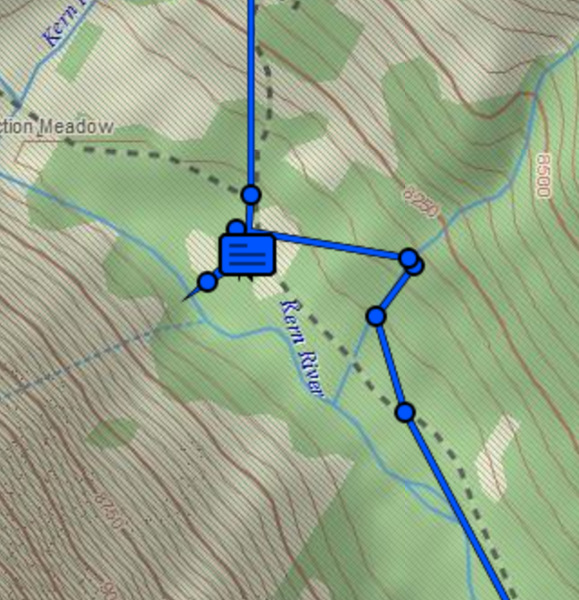 I took a quick fix with my Delorme, and looked at where Junction Meadow was on my map. Due to the simplicity of MGRS I knew I was almost exactly 300 meters east of where I wanted to be without having to plot myself on the map. Also due to my job, I know that over easy terrain, I take about 65-75 steps per 100 meters and high 90 steps over rough terrain. I took out my compass and pointed it west and counted my steps when I got to 300 meters the trail was about 100 feet in front of me ( I was only a little off on my step count). Junction Meadow was beautiful in its own way, but I enjoyed Moraine Lake a little more. Junction Meadow had bear droppings scattered around and I was a bit nervous that tonight would be the night we woke up to a bear checking out our bear canisters. 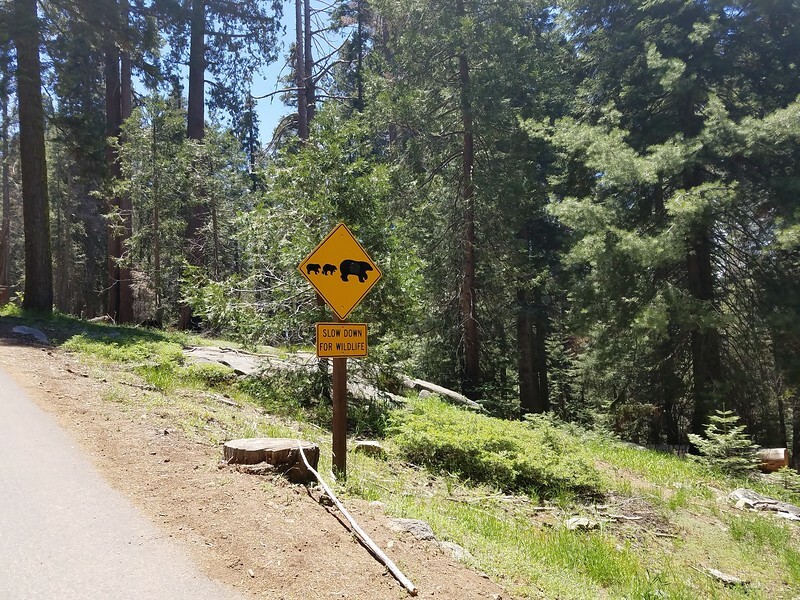 Thankfully despite the bear signs, we did not encounter any wildlife other than a few deer. The mosquitoes were pretty strong and were biting us pretty good while filtering water and eating dinner. Once we ate and stashed our bear canisters a few hundred meters away, we went to bed early. 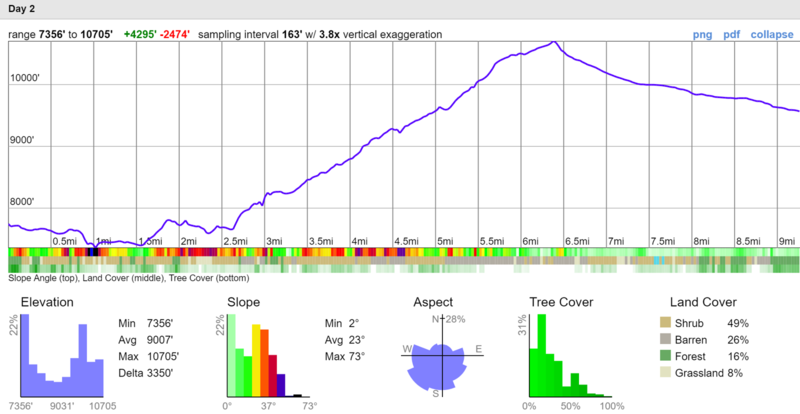 The next two days would be filled with climbing and bring us to the top of Mt Whitney. At the end of the night, we were more than halfway through the trip, we had accomplished a lot and made it through some sticky situations. I was getting excited to be getting close to our goal, Mt Whitney. I woke up on the morning of day 5 happy to have not met any bears in my sleep. Day 5 started the climb toward Mt Whitney. 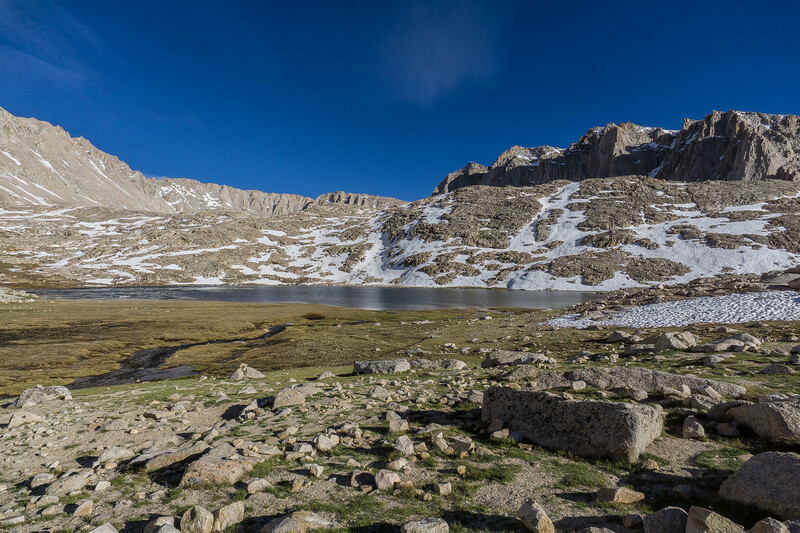 We would hike from Junction Meadow to Guitar Lake, the last water source before climbing Mt Whitney. I thought it would be a hard day of climbing, but it really was not too bad of a day at all except for one water crossing. 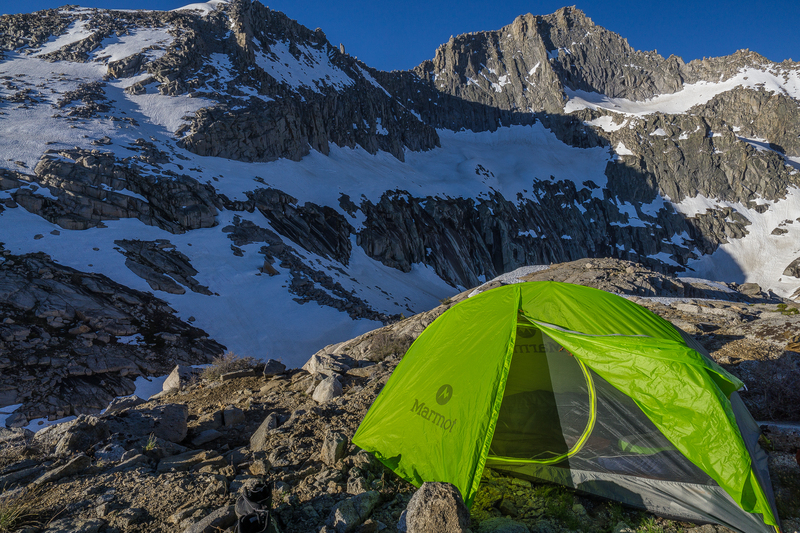 The Day 5 map can be found here on Caltopo . 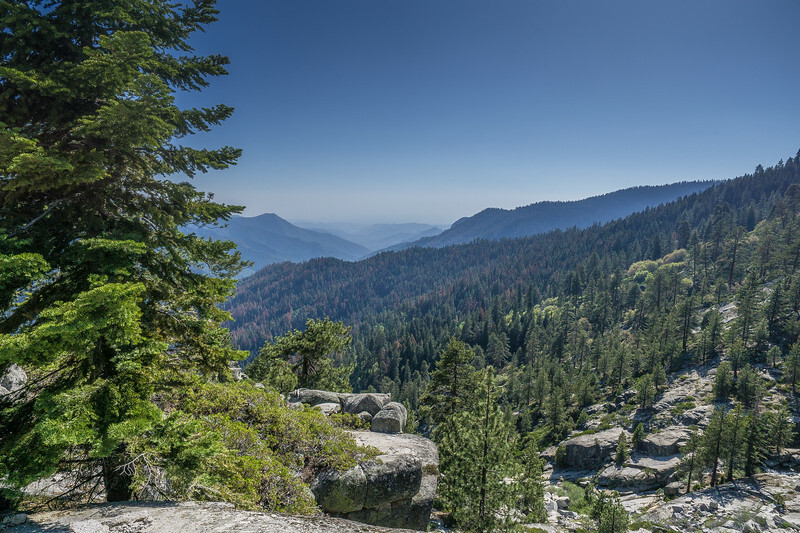 The morning started off with a climb, and we slowly rose above the pine trees and were met once again met with amazing views of the Kern River Valley down below. 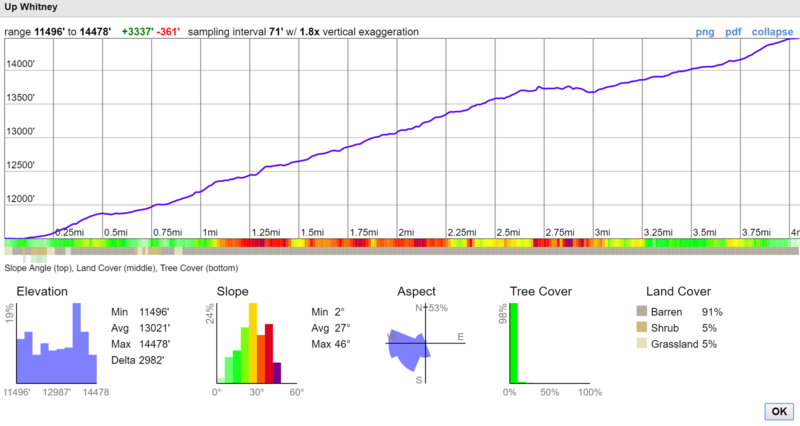 The trail climbed but was nothing crazy, it rose at an easy grade with some switchbacks. The trail eventually came to a “stream” crossing. We have had some challenging water crossings and usually found a way to climb across on a log or get a little wet. But this one “stream” just did not give us a break. We dropped our packs and looked up and down the river for a rock or a downed tree to cross. We even made our own bridge to cross but didn’t for obvious reasons. The water was fairly deep, rough and had a good current. At this point of the trip we were pretty far in, and turning back was not really an option and there were some parts of the trip I was not ready to go over again. So after a bit, I decided this was our only spot to cross and I was going to get wet, we just had to do it safely. I took out my trusty 550 cord and secured it to a strong bush behind a rock. Yes, I know a bush doesn’t sound like a strong plant to anchor my self to but I took some nice tugs on the 550 cord before plunging in. I tied the other end around my waist and took my ice ax in my hand and strapped on my gloves. I took off my shoes and socks and dipped into the freezing rushing river. I took my time feeling each step and not taking the next until I knew my foot was secure and not going to slip. I made sure there was tension on the 550 cord which helped add stability as I walked. As I slowly made it through the waist deep water and finally reached the other side. My feet were cold as hell, so I went directly to a rock and sat on it to warm them up. I had left all my gear on the other side of the river to cross safely. Once on the other side, I tied the 550 cord to my ice ax and anchored it securely in some stones. The 550 cord was now tight and stretched across the cold, deep stream. The picture below is of the stream crossing with the 550 cord stretched across. I am on the side with my ice ax anchored and am looking back at the trail where we were coming from. Once the 550 cord was secured, grabbed onto the line and use this to stabilize myself as I crossed. I then made multiple crossing back and forth carrying our gear in safe loads. It took 3 or 4 trips, but I made it across with all our gear and our gear stayed dry. Yes, the water was cold, but it actually ended up feeling good soaking my sore feet. The whole crossing slowed us down for over an hour, but we made it safely across and in one piece, ready to attempt our last big challenge, Mt Whitney. As the trail meandered we were treated by some amazing meadows, streams and mountain lakes. 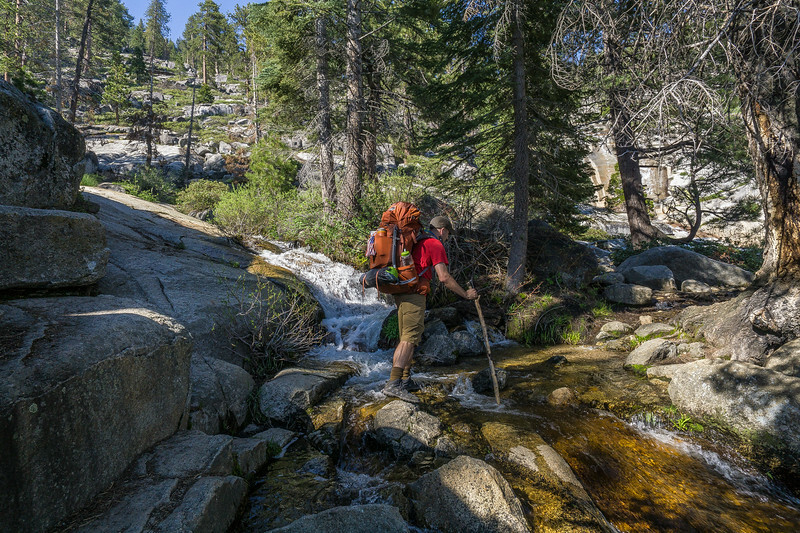 A short time after our water crossing we hit the Pacific Crest Trail. 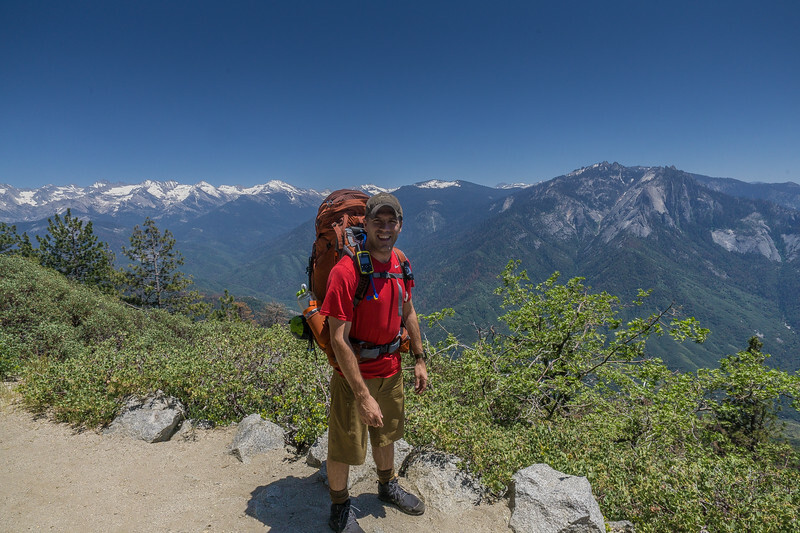 Once on the Pacific Crest Trail, we started to enter a little bit of civilization again, we started running into other hikers for the first time in a few days. The farther we traveled down the Pacific Crest Trail, the more and more frequent we ran into other hikers. 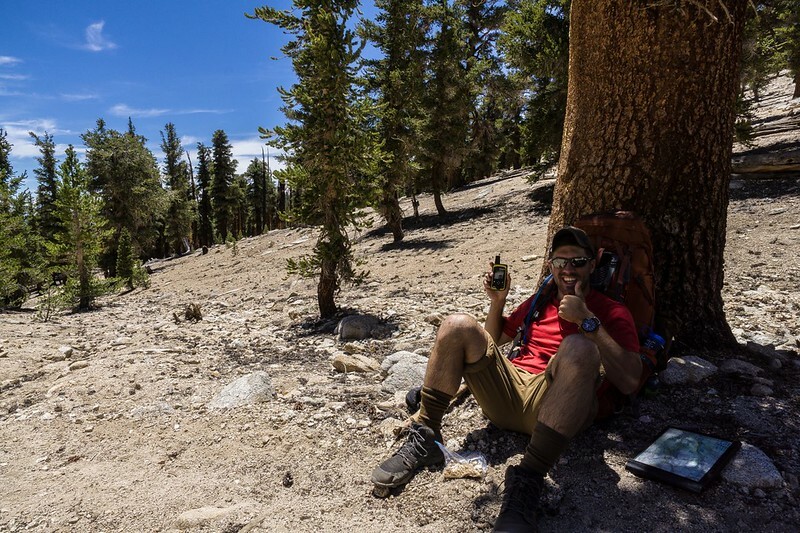 A few more miles down the Pacific Crest Trail, my Delorme chirped with a message. This was the best message I could have received while on my hike, my sister had a baby girl and I officially had a new niece! 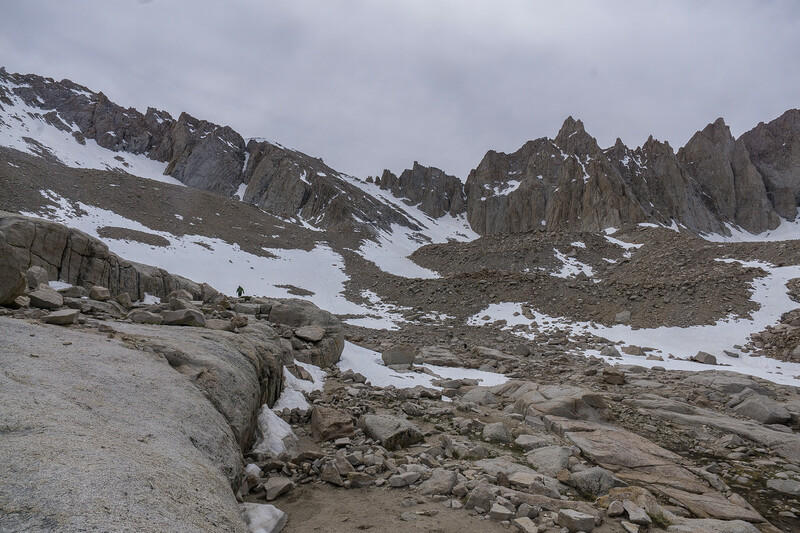 I did not take a whole lot of pictures on day 5, I wanted to make it to Guitar Lake at a decent hour so we could get an early start on our 6th and final day when we would climb Mt Whitney. When we got to Guitar Lake there were about 3-4 other groups of hikers making camp. 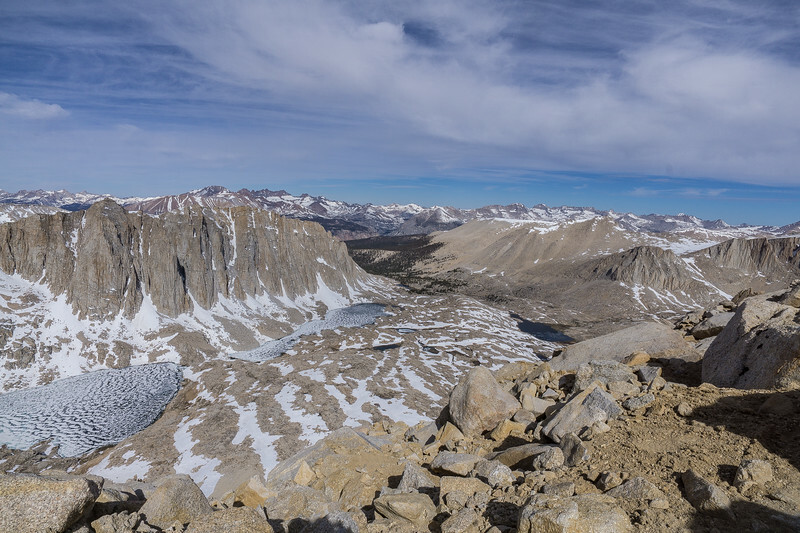 Despite this “crowd”, we had a nice private spot with an amazing view of Guitar Lake and Mt Whitney in the background, I really didn’t even notice the other hikers much. 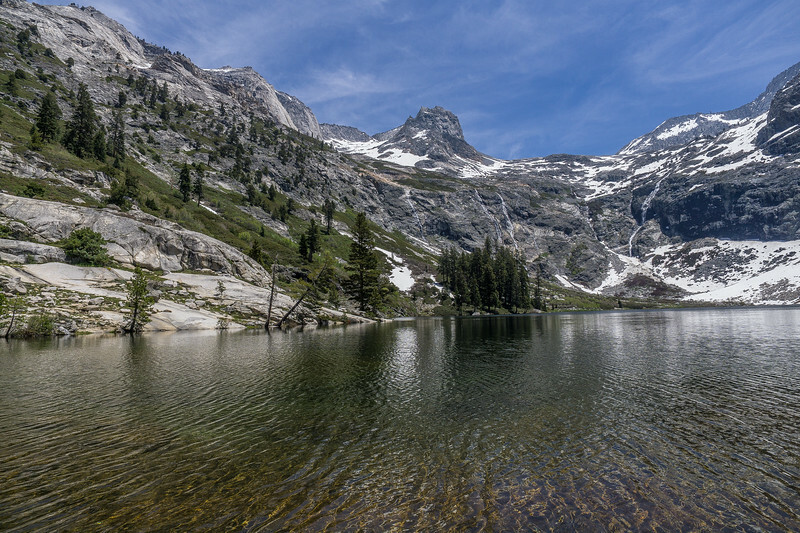 When you are close to Guitar Lake, it does not look much like a guitar. 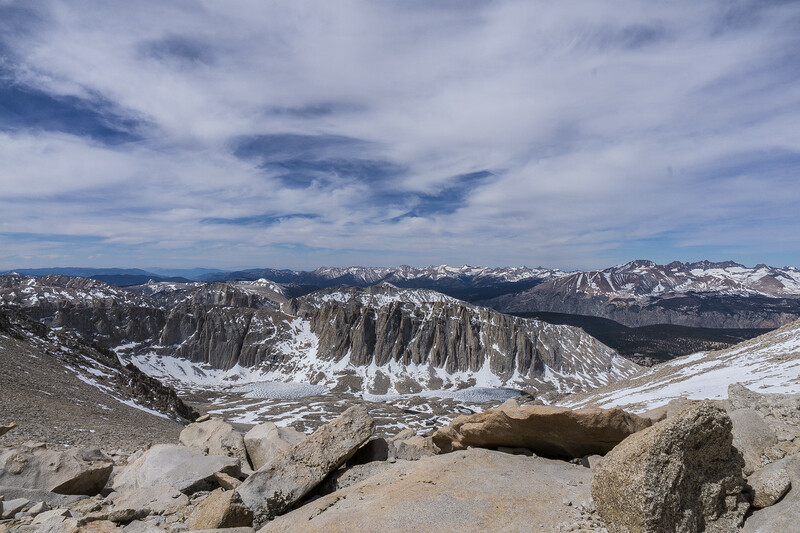 Once you start climbing Mt Whitney and have a view looking back down, the lake really does look like a guitar. At Guitar Lake, we didn’t have to really worry about bears, but there were marmots everywhere! They came pretty close and did not seem to be that scared of us, but if I stood up and walked toward them, they instantly ran away. These marmots looked pretty fat, and I bet they have taken more than a few snacks from some hikers in the past. I would not stray too far from your pack and food, you might have a fat little marmot break in and steal your dinner! 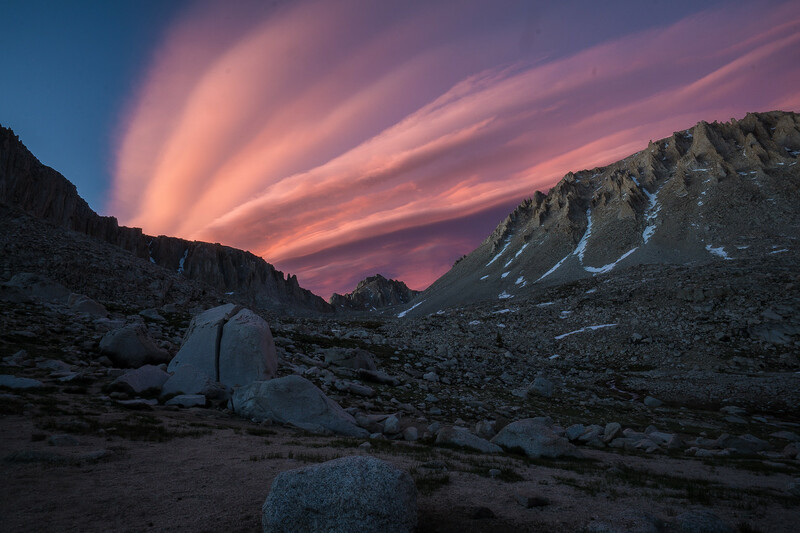 Arriving at Guitar Lake early let us experience a great sunset with Mt Whitney in the background. 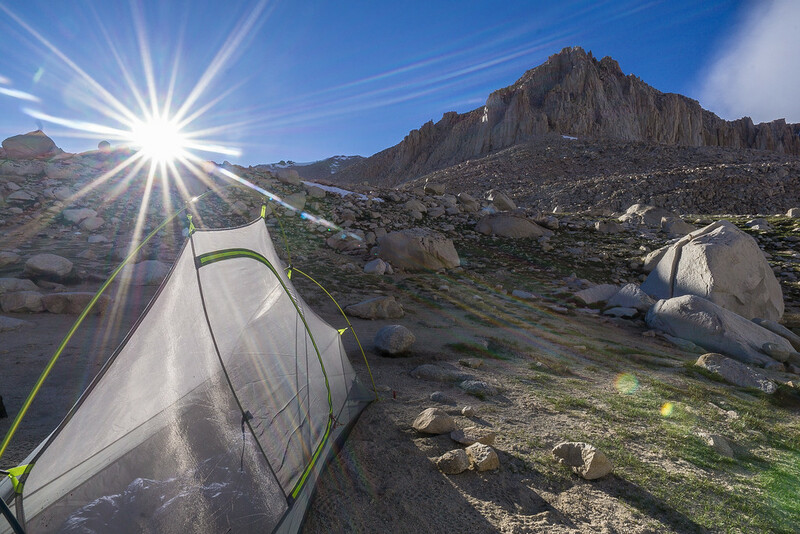 We ate a large dinner and got to bed early, tomorrow was the big day we would climb to the summit of Mt Whitney and make it back to civilization ending our amazing trip. Today was finally the day; it was time to wake up and push my body one last time. 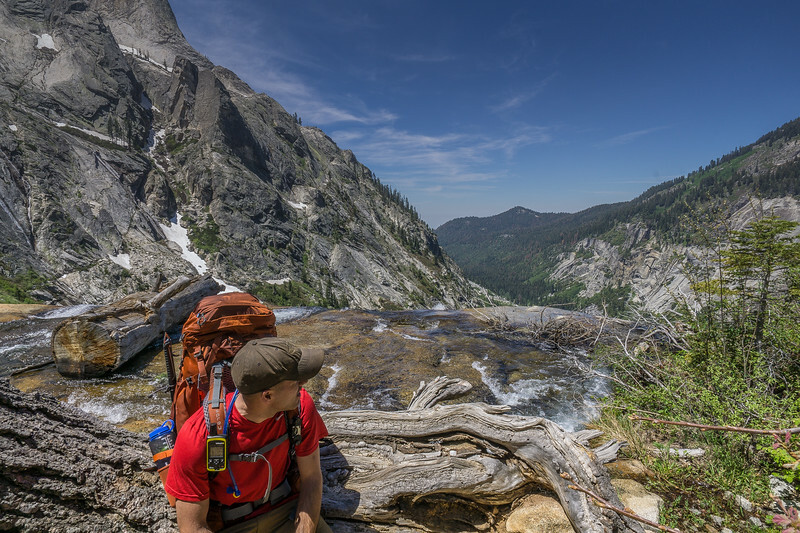 After five days and 56.5 miles of beautiful views and hard hikes, it was time for 15.6 more. Today was the last day of the hike, the longest day of mileage and arguably the toughest day of climbing. 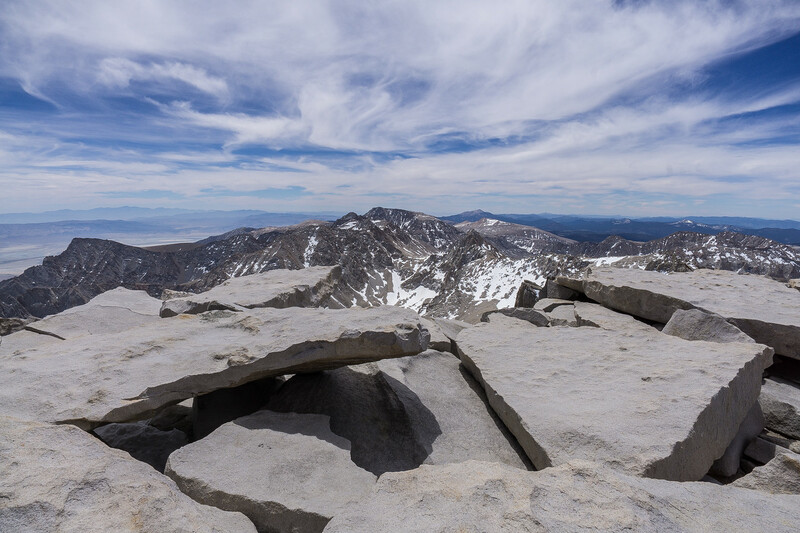 It was finally time to climb Mt Whitney the tallest mountain in the lower 48 states, standing a tall 14,505 feet. Between the snow, the climb and the altitude, this was going to be a tough day. The up and down Whitney Day 6 map can be found here on Caltopo . I woke up a couple of times in the morning. I wanted to get a head start, but I also did not want to by climbing up an icy mountain in the dark. 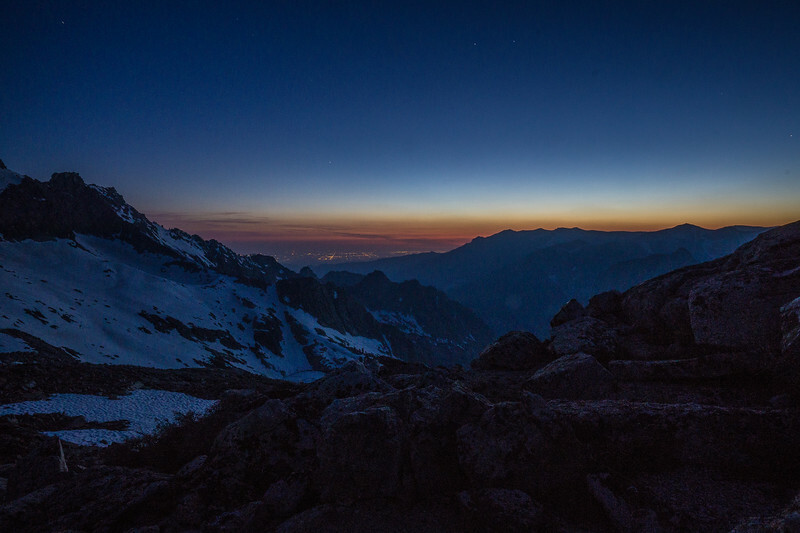 I was not familiar with the trail ahead, so I decided to wait till right before sunrise to get up. I woke up and shoved a bunch of calories down which did not need cooking. I didn’t want to waste time cooking, so I ate all dry food (Peanut Butter, Granola, Beef Jerky, and a snickers bar). 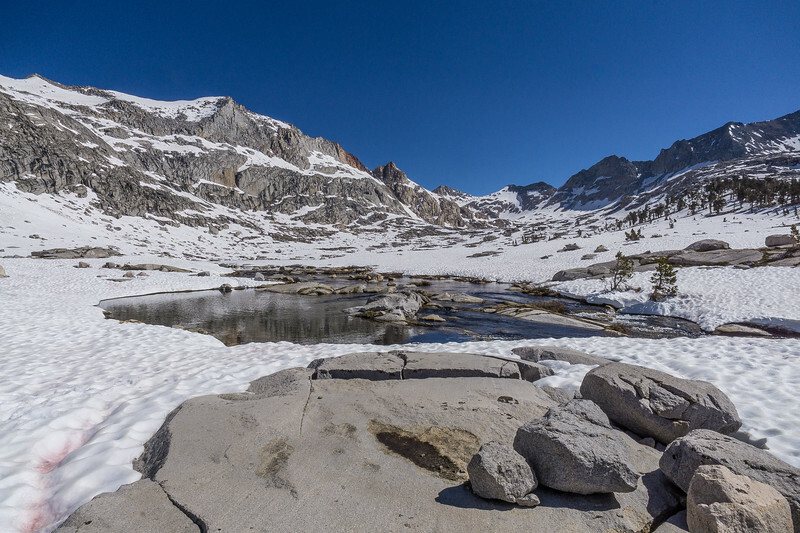 Once we packed up and made it past the lake, the trail was quickly covered in snow, which was frozen over. This was the plus of starting early, having the snowfields frozen, so we were not sloshing through slush or post-holing our way to the switchbacks. 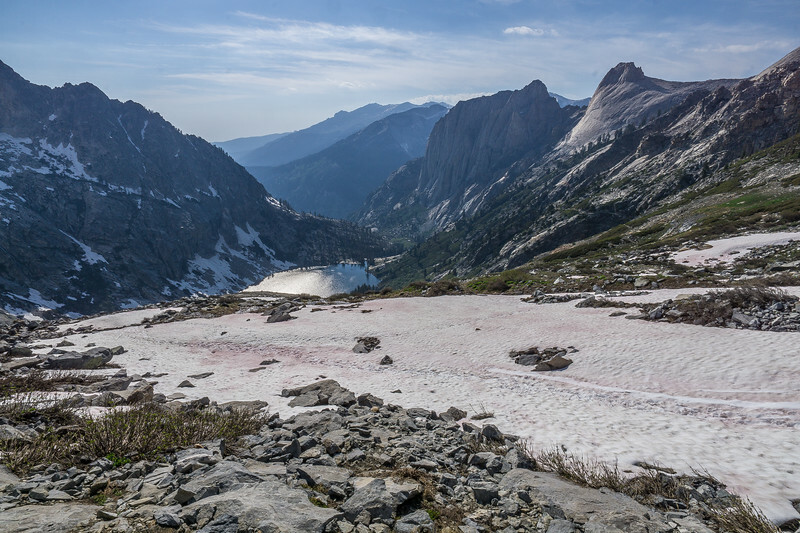 There were a couple of groups of hikers, and we were spread out over the snowfield all looking for the trail while heading in the general direction of the base of the switchbacks. We never planned with the other groups, but it was an unspoken team effort to spread out and find the trailhead. The switchbacks were not too bad, just a few patches of icy snow here and there, but it was a climb. 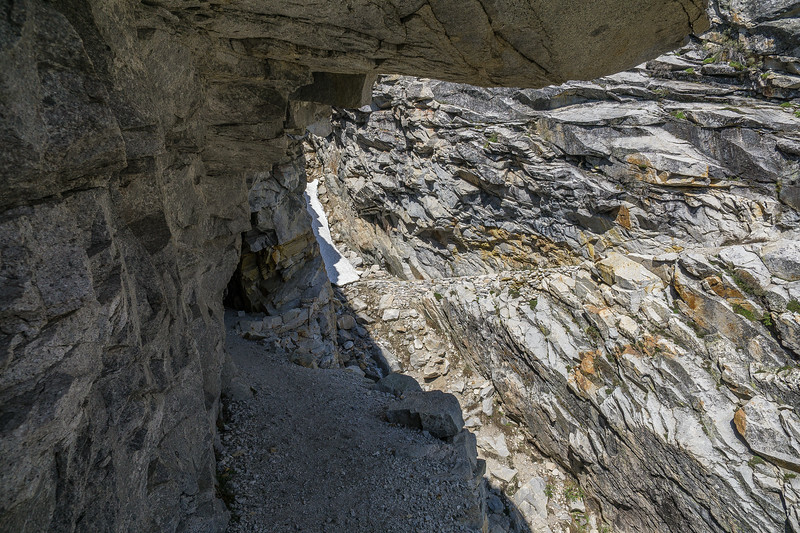 Once you get to the top of the switchbacks, you are on the crest of the mountain, and follow this skinny path with cliffs to your left falling straight back down to guitar lake. Forgive me for not taking a lot of pictures while on the trail to the summit; it was about 30-35% covered in snow and ice. 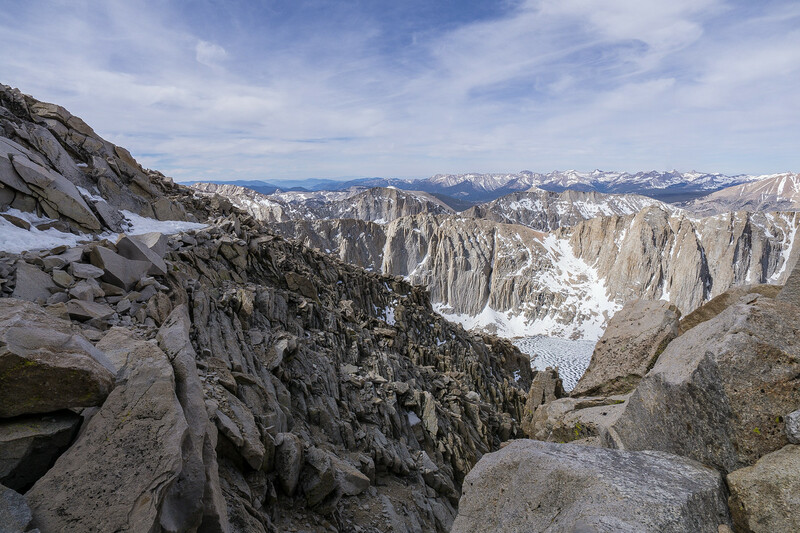 A couple of times, I felt as if I was just hanging off the side of Mt Whitney by just my ice ax. In reality, I really am not a huge fan of heights, but I have gotten a whole lot better with heights over the years of being in the military. There was one guy on the trail who we met who was just in sandals; he made it to the top… so the trail was nowhere near impossible. 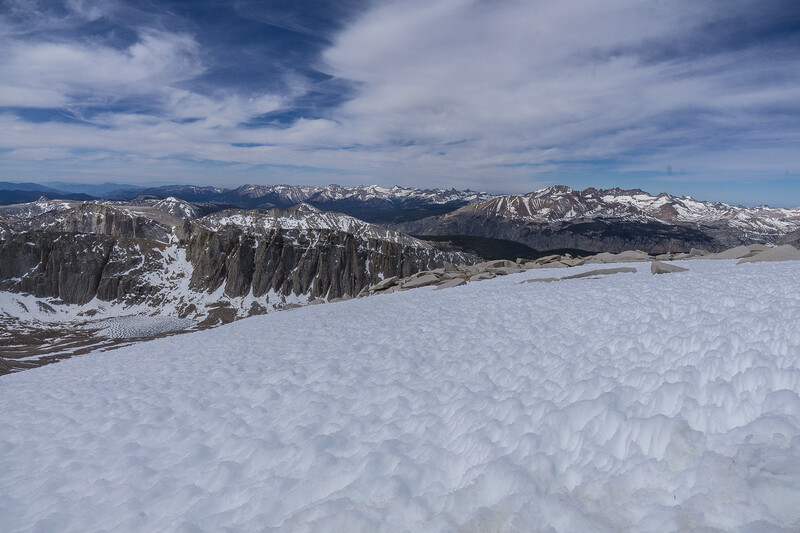 On that note, I would never recommend hiking in the snow to the top of Mt Whitney in sandals…. just don’t do it, don’t even think about it. 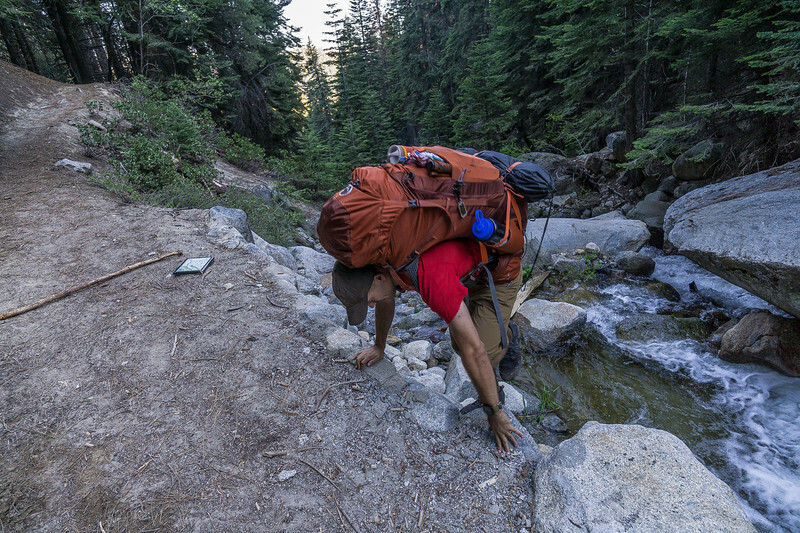 Hiking with the right gear helps keep you alive and may even just help you stick to your plan. The particular hiker in sandals asked to borrow my Delorme to text his buddy. 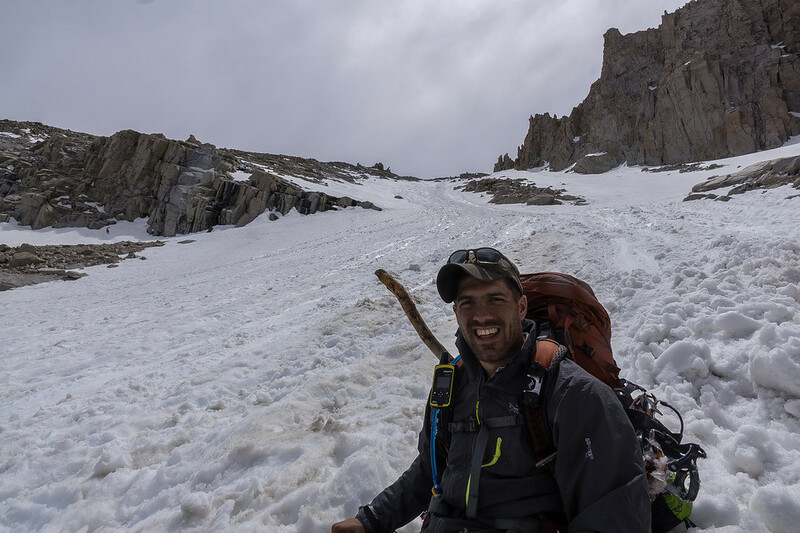 Sandal man planned to meet his ride home in Whitney Portal, but without an ice ax could not safely get down the chute on the east side of Whitney. He texted his buddy from my Delorme and told him to me him at horseshoe meadow at 9 pm. His text was sent at 8:43 am so he greatly extended his day just because he did not bring the right tools. 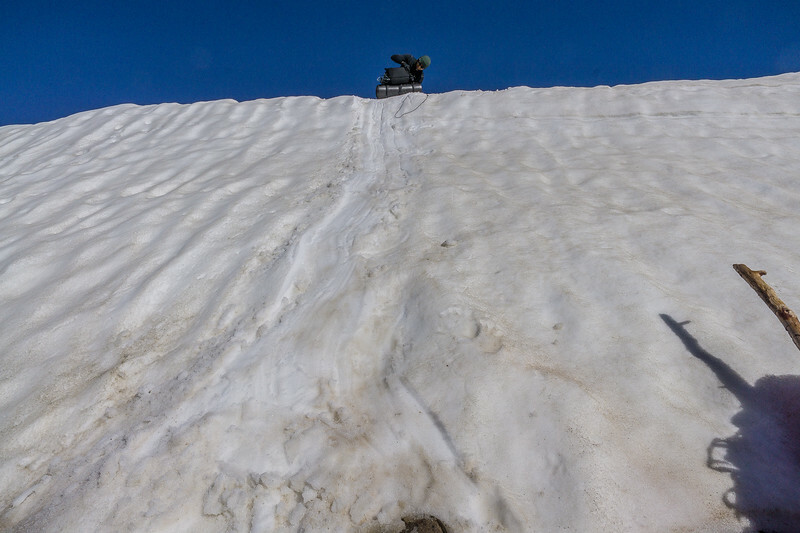 As we got close to the final push, there was a long stretch of snowfield. There was a nice trench stamped out by the many hikers that have pushed through it, and I did not need crampons climbing. I just kept my ice ax in my hand at the ready, and safely climbed up. On the way up toward the summit, we took a lot of breaks. It was the end of an entire week of climbing. 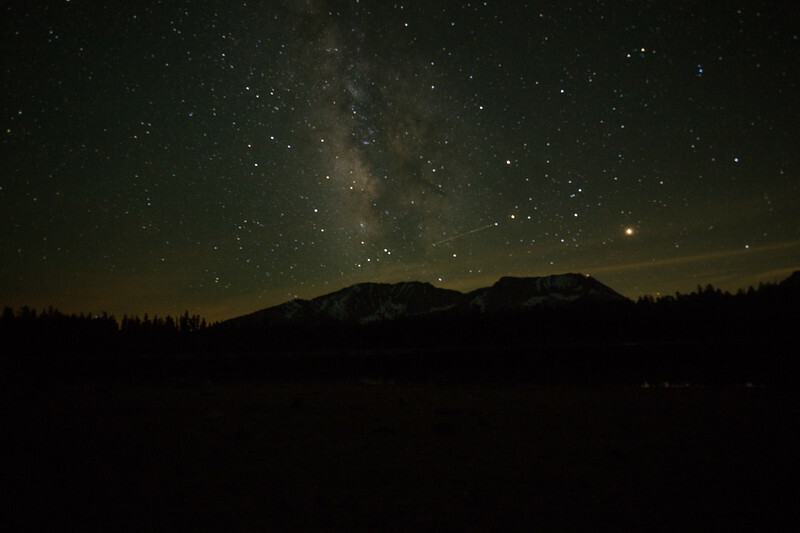 We met a couple of day hikers who woke up at 2 am from Whitney Portal. We leapfrogged each other all the way to the summit, but they ultimately beat us to the summit. A few times where we stopped at the same location, we picked their brains on the 99 switchbacks. 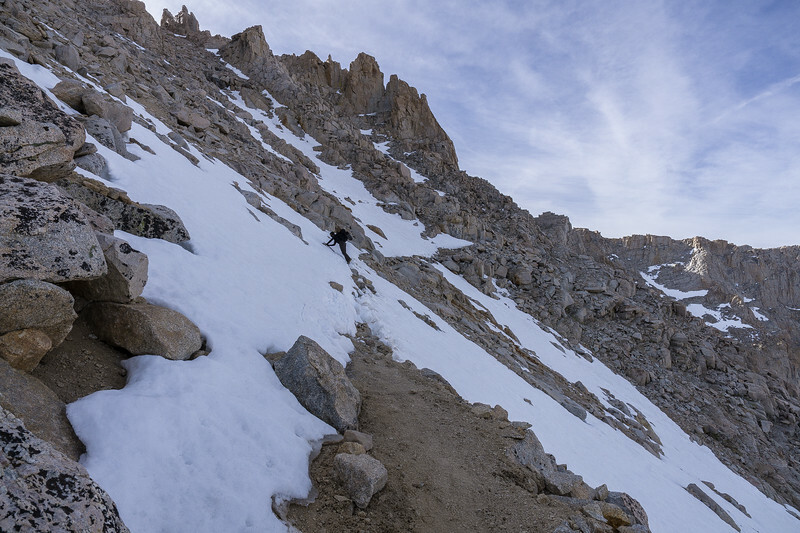 I knew that climbing to the top of Mt Whitney was not our only challenge of the day, going down would also be a challenge with the 99 switchbacks covered in snow; the steep icy chute would be the way down. They told us a lot of people turned around in the morning because of how icy the chute was, a lot of hikers just couldn’t get up. Once we made it to the top, we found out the two hikers we were leapfrogging all morning were from the next town over from where I live in California. They graciously offered to give us a ride back to Lone Pine from Whitney portal and were our saving grace at the end of our amazing trip. 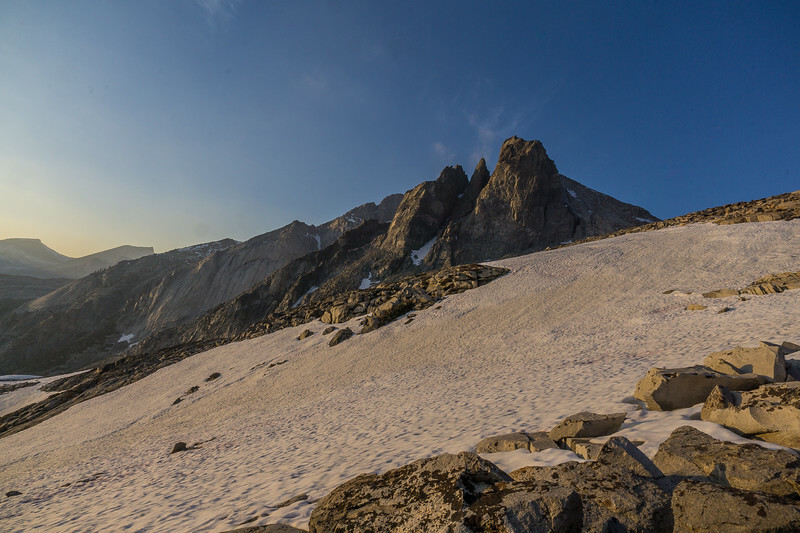 Once we got clear of the final snowfield, I could almost see the summit. We stopped for a five-minute break. I stood up ready to make the final push of 300 – 400 meters and I took one step and sat back down. I was feeling really tired due to the week of hiking and the altitude. I sat back down for another five minutes. Once we could see the weather shelter, I knew the top was close and got a second wind. When we got to the summit, I was tired, but I almost didn’t feel it because of how I excited and accomplished I felt. It was an amazing feeling and one I will never ever forget. From the weeks of planning, the route, the logistics, food and finding a buddy crazy enough to take a week off from work to join me. All the time, effort and energy was worth every ounce of squeeze and paid off! We made it to the summit at around 11:30 in the morning and left about an hour later just past 12:30. We took a lot of pictures and ate a lot of food; I had another bag of beef jerky and two or three snickers. Another hiker shared some Jameson from his flask with me, and everyone was just happy and relaxed. On the way back down we stopped at the first big snow patch to put on our crampons. Going up was one thing but having to look down the entire time, I felt much safer with my crampons on. Even in between the snow and ice, I left my crampons on. I did not want to slow down on the way down, and there was wet mud my crampons sank into and I just overall felt more comfortable. The hike back over the crest went by a heck of a lot quicker on the way down. It was also our turn to encourage the hikers who were still coming up to the summit. I knew how they felt, and I was glad I was going down this time. Once we made it to the chute, I saw why our buddies we met on the trail said a lot of people turned around at the chute in the morning. The chute was completely covered in snow, and boy was it steep! There were two older gentlemen, my buddy and the two guys we met on the way to the summit all sitting at the top of the chute. The two guys we met and the older gentlemen all had never glissaded before. I gave a quick lesson at the top of the chute, and one of the guys started climbing down/sliding a little at a time. I move a little over, observed a clear path down the chute, sat on my but and prepared my ice ax. I proceeded to unhinge myself from the side of the mountain, and I instantly started to slide. I slowly picked up speed until I felt like I was flying! 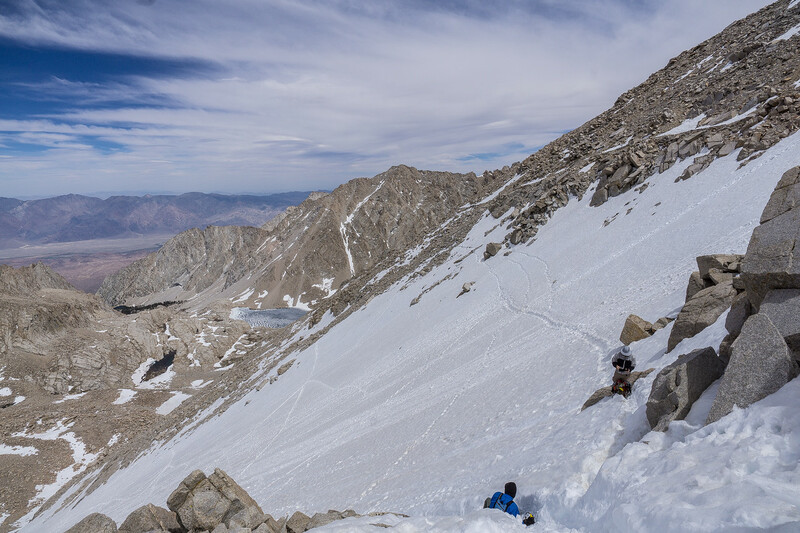 Making it to the top of Mt Whitney was a great amazing feeling, but glissading down the chute was just downright one of the most fun experiences of the entire trip. If I weren’t so tired, I would have hiked back up and glissaded down again! Glissading down the chute not only was a lot of fun, but it also cut off a lot of hiking time down the 99 switchbacks. Once at the bottom it took us a few minutes to acquire the trail again. 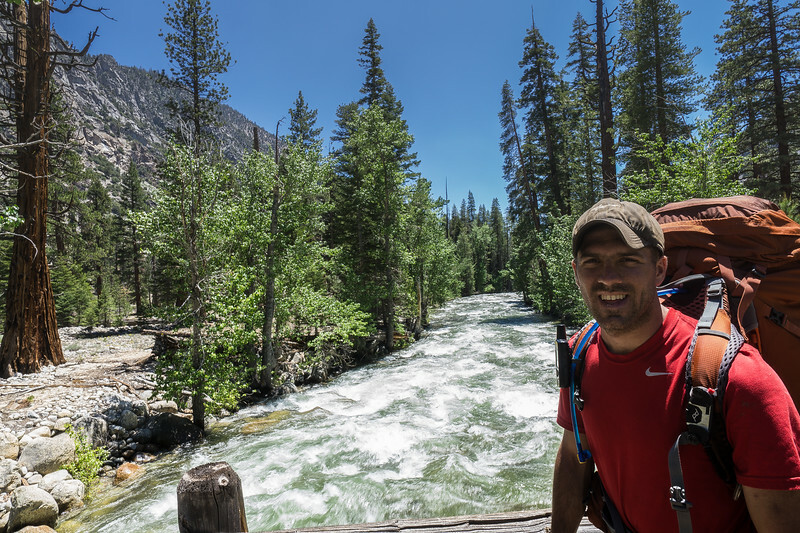 Once on the trail, it was easy to stay on track the rest of the hike back to Whitney Portal. As we hiked further from Whitney, I couldn’t help but looking back at the shoot and smiling. I just kept laughing and couldn’t believe we just glissaded down the slope! 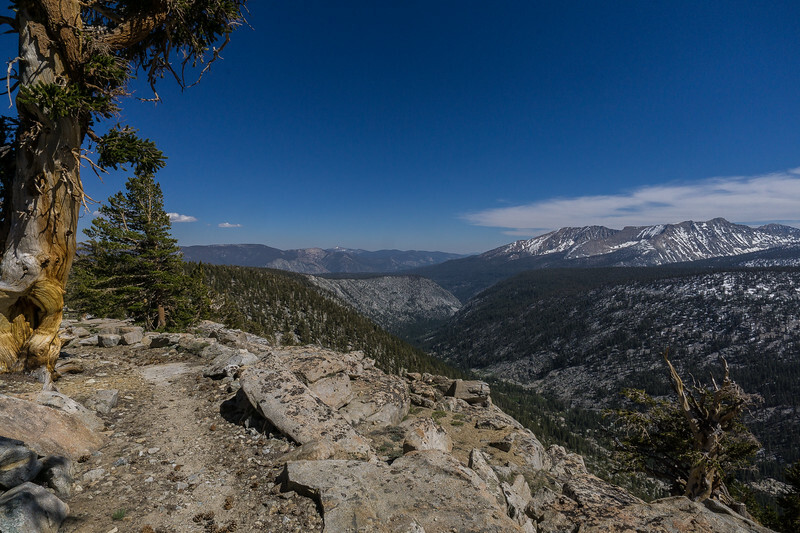 As we hiked further and further down toward Whitney Portal and the end of our hike, I realized how much work our two friends we met on the way to the summit did today. 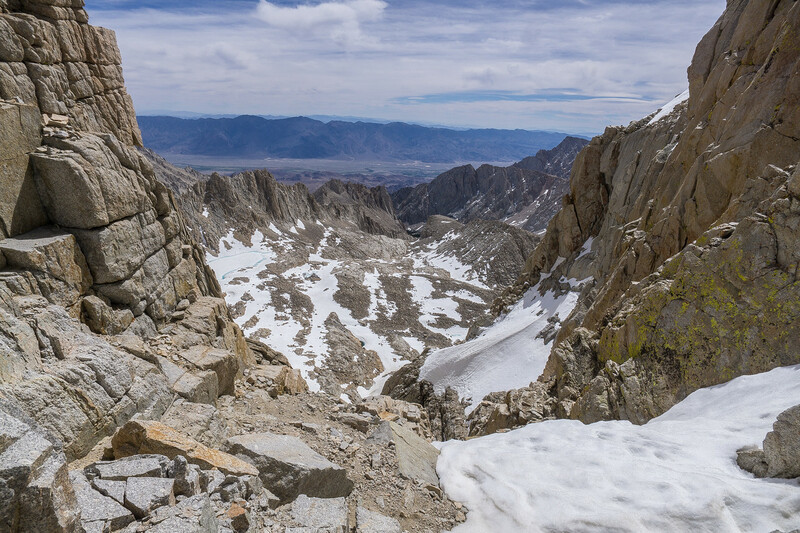 The hike up to the 99 switchbacks was steep and grueling, I was glad to be going down it, and would not want to hike to the Summit of Whitney in one day. The hike down was absolutely beautiful! As we neared the bottom, my feet and legs were beginning to get sore. My body was finally beginning to feel the effects of a week of backpacking. The final switchbacks to the floor seemed to go on forever. 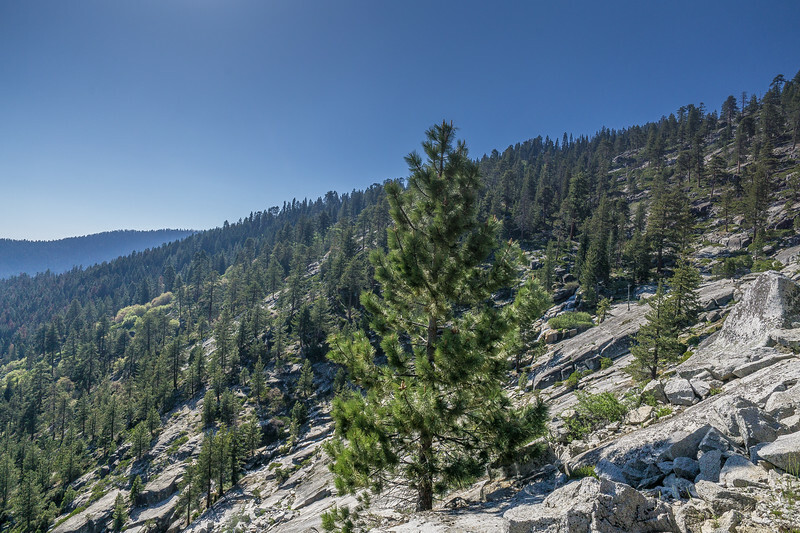 Having not started our hike at Whitney Portal, I had no idea how much further we had. I finally put my map away and was pushing myself toward the finish. I was getting pretty tired despite the downgrade of the trail, and then I made the turn around one switchback, and I saw a parking lot and cars. I was elated when we reached the bottom, it was a week of long hard hikes, testing my fitness and mental fortitude. The feeling of accomplishment was one I cant describe, a mixture of great joy combined with exhaustion. I was finally ready to take off my pack and kick off my boots. 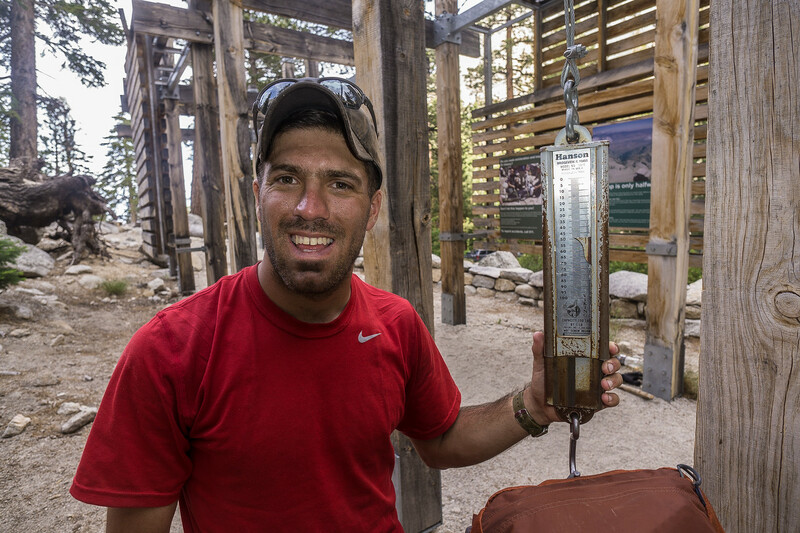 At Whitney Portal, where the day hike starts they have a place for hikers to weigh their pack. 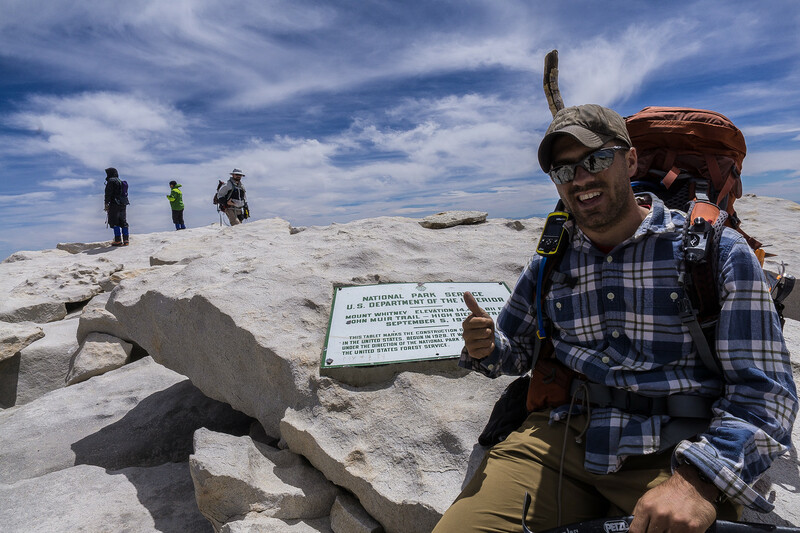 I was proud of carrying a week worth of gear and food and not ditching my pack to summit Mt Whitney. On the crest of Whitney toward the summit, another hiker commented on the size of my back. 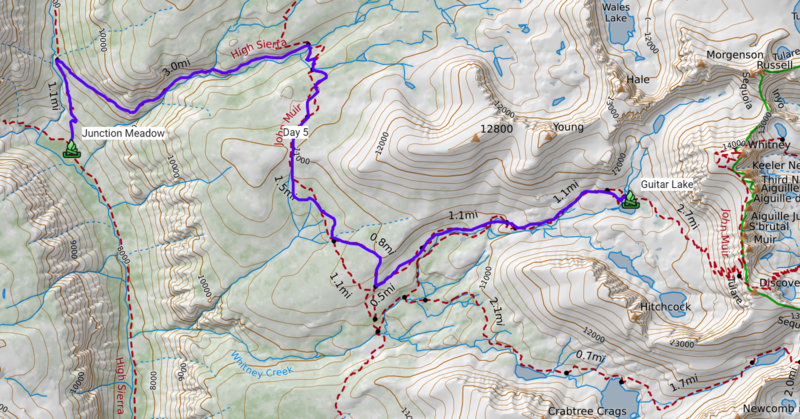 They asked me why I didn’t ditch it at the intersection of trail crest and the John Muir Trail and summit without it. 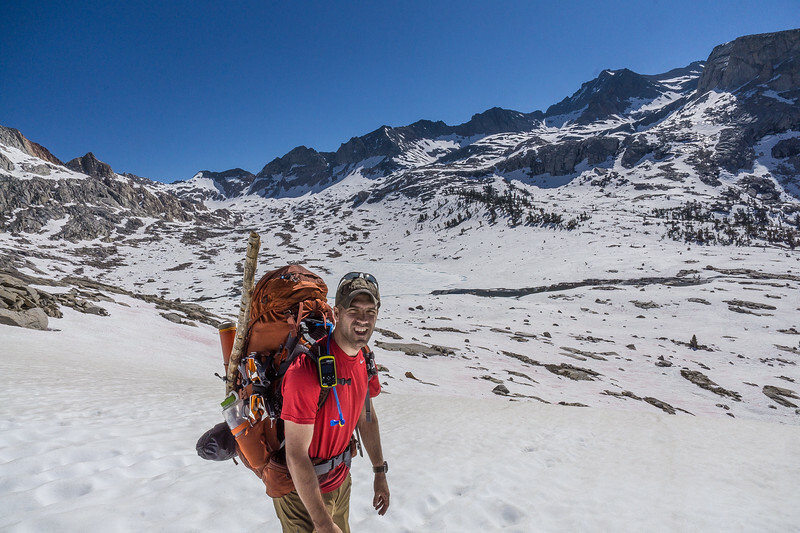 I didn’t drop my pack before the summit because I never surrender and will never cut corners to accomplish my goals. The mountains will always remind you who really are inside. I read this whole thing top to bottom. What a great trip! Very daring this early in the season, but it seems like you have the right skills. Thanks for the great rundown and all the amazing photos! jaredmazz makes me happy to hear someone has read the entire thing :-) Also welcome to the Seek Adventure Forums! I would say the biggest skills you need to do this hike early is Ice Ax/Crampon training and comfortable with a map. 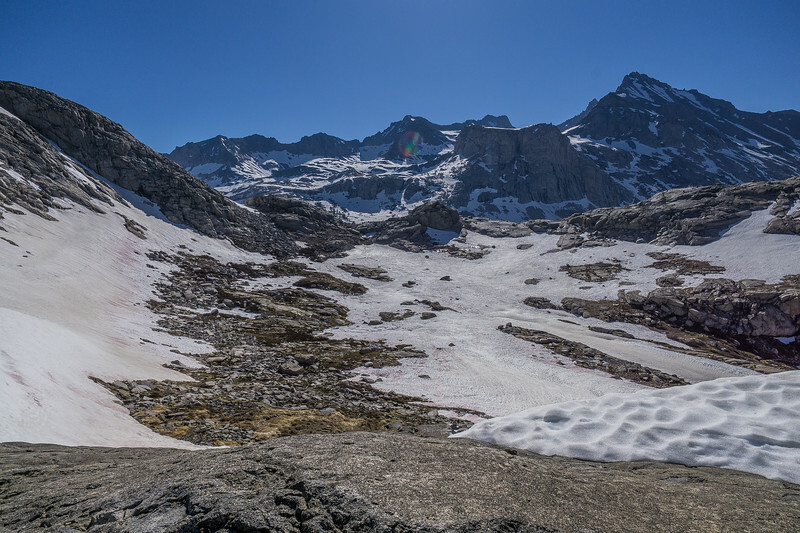 The High Sierra Trail normally seems like it would have been very well marked and easy to follow, but once you bring snow into the mix and you do not have a trail to follow, you better be comfortable with a map and compass. 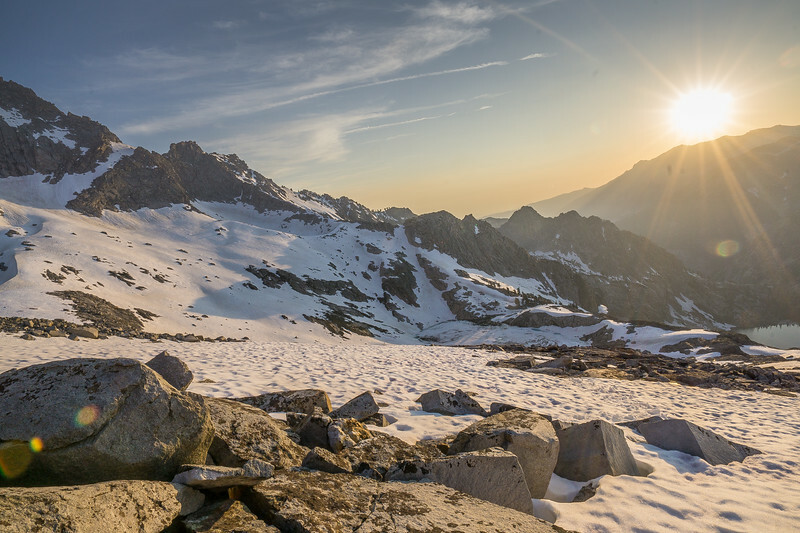 MikeJones Any suggestions for someone who has never hiked in the snow or used an Ice Ax or Crampons? 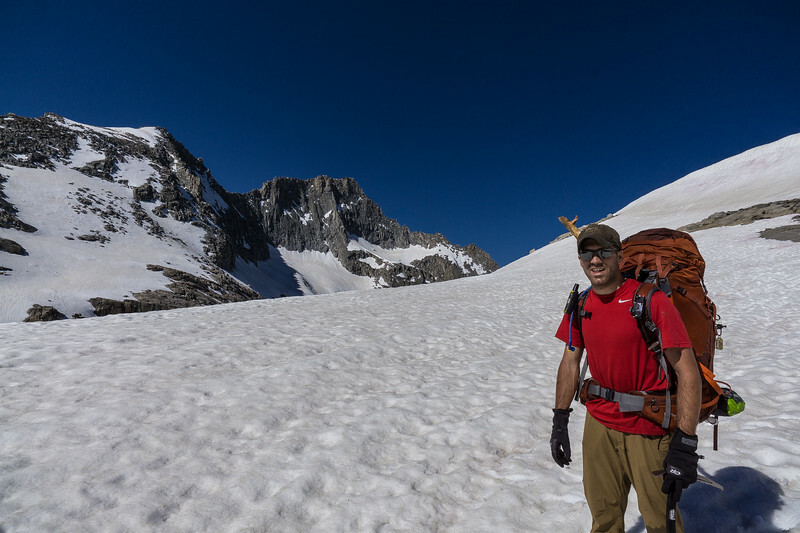 CaliHiker Any suggestions for someone who has never hiked in the snow or used an Ice Ax or Crampons? I would highly recommend reading the book: Mountaineering: The Freedom of the Hills.